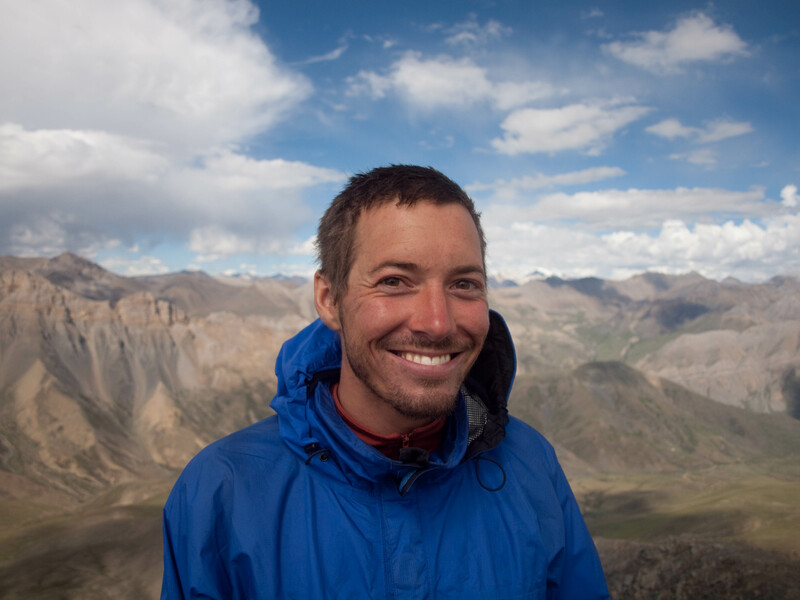 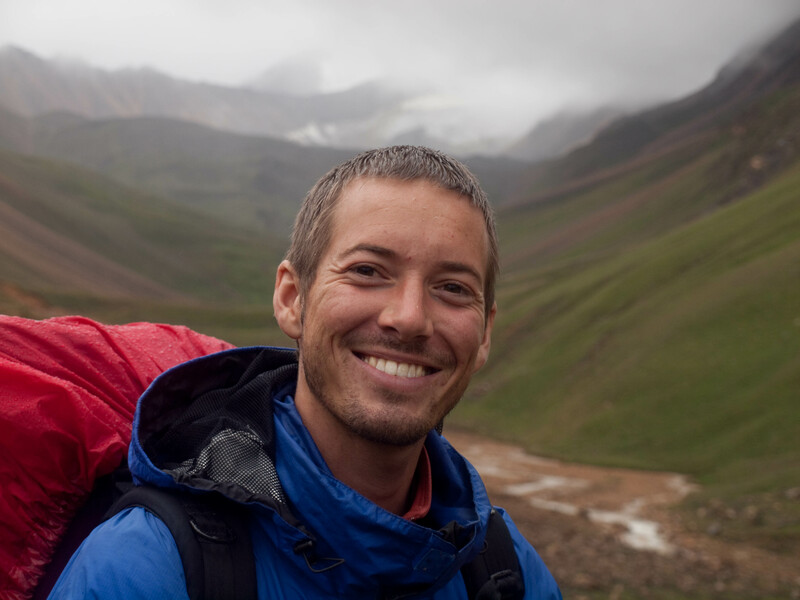 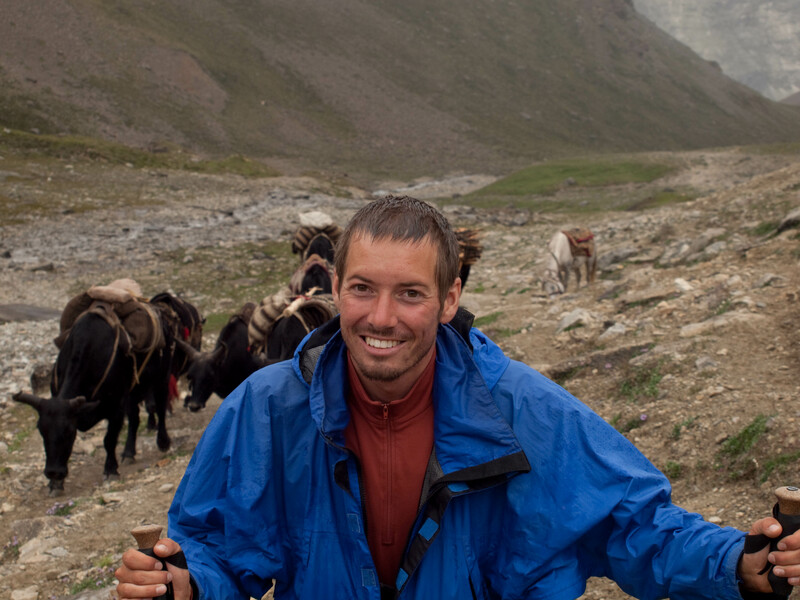 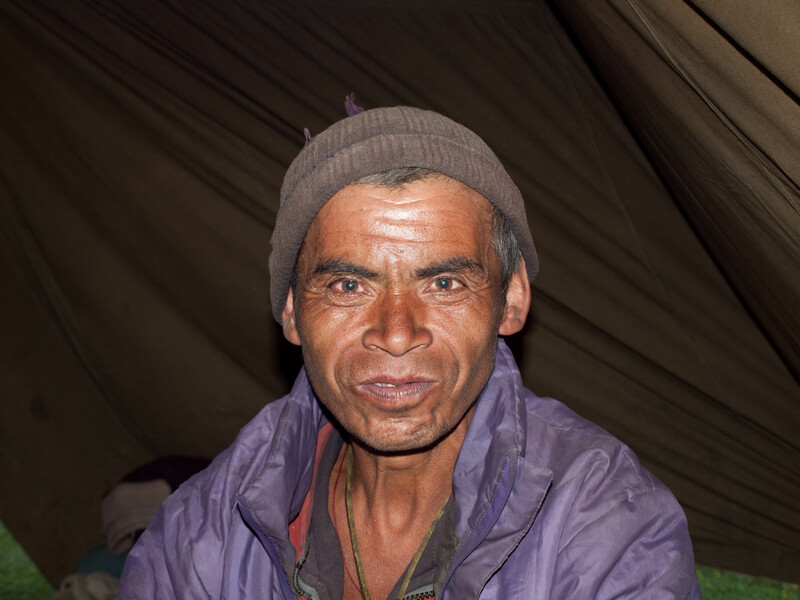 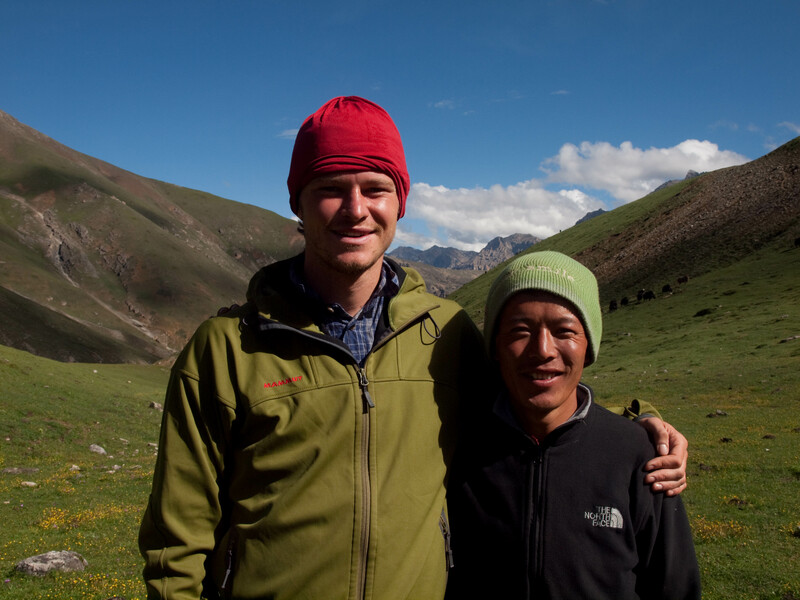 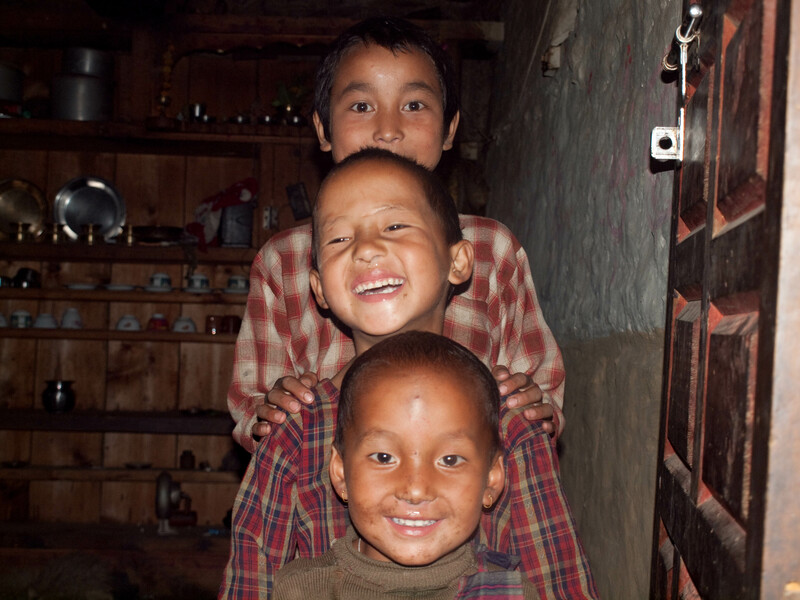 For the summer of 2009 my friend Andi and I had planned to see the northwest of Nepal. 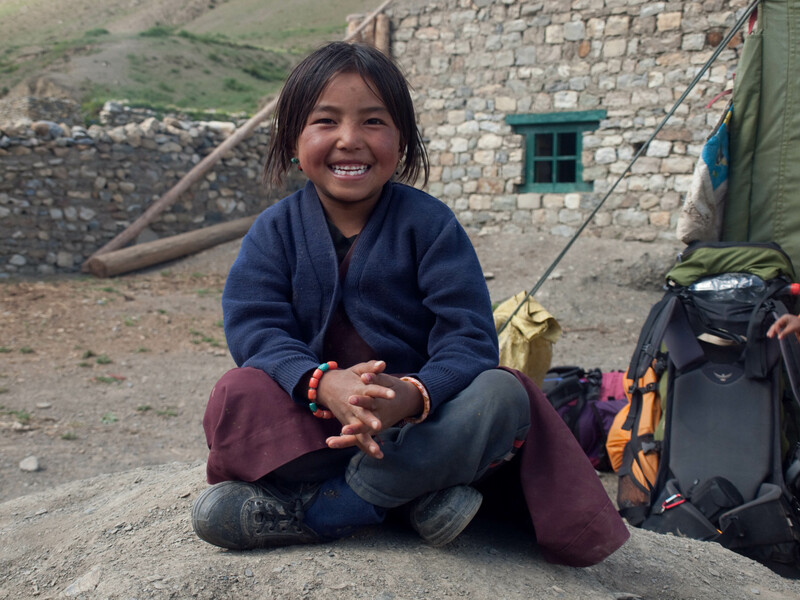 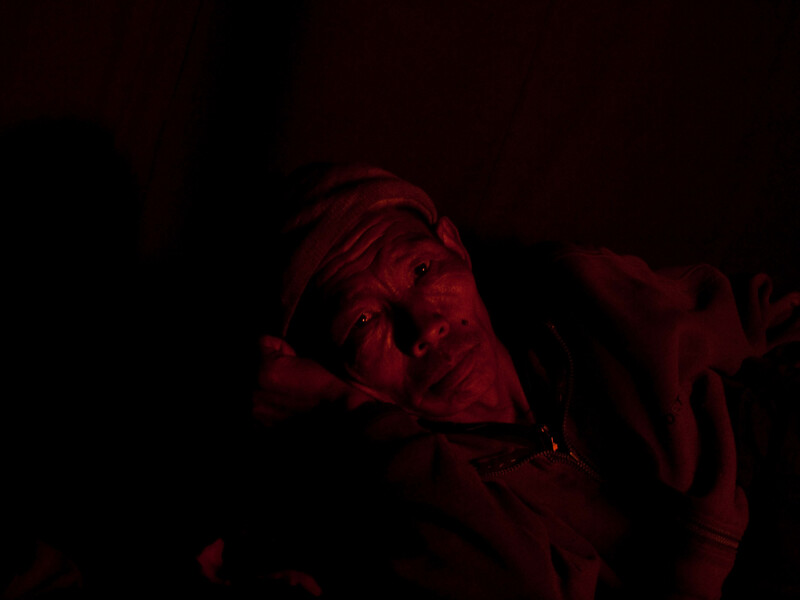 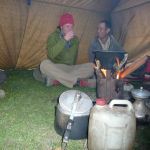 We packed our equipment – my small tent, the cooker, warm clothes and warm sleeping bags – and flew to Asia. 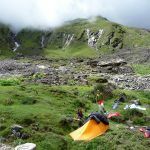 This trip in 2009 was my second trip to the country. 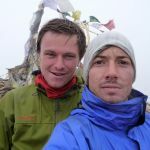 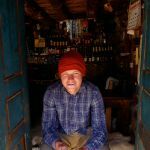 After I finished school I had stayed in Nepal for three months and did some trekking in the Annapurna region, learned some Nepali (unfortunately I don’t remember much today), and also spent time in the tropical south of the country. 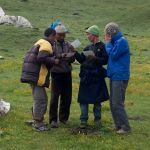 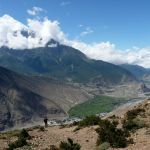 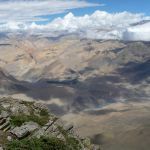 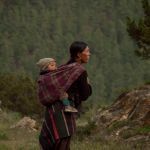 After reading Herbert Tichy’s “Land der namenlose Berge” (‘land of the mountains without names’) I had the plan to return and see the region to the west of the Annapurna – the Dolpo. 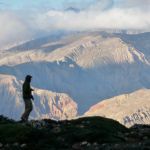 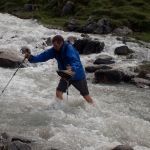 Andi, who is a good friend from my days in Innsbruck and an ardent mountaineer, was just as enthusiastic about this idea and we planned the trip together. 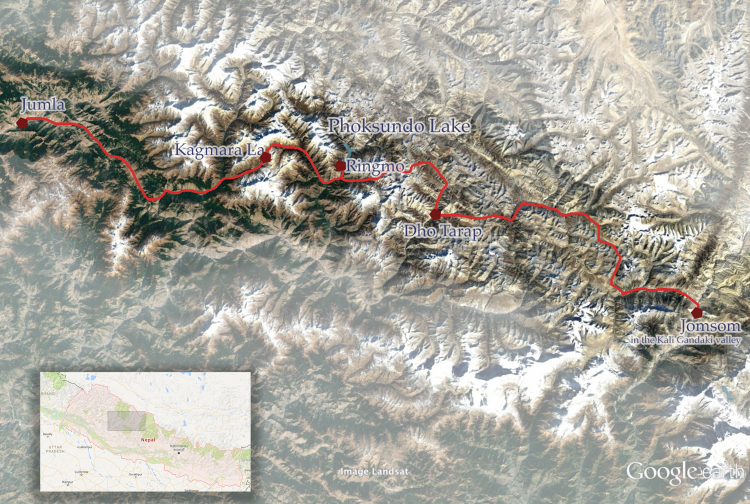 The map shows the route we walked in 2009 – from Jumla in the west to Jomson in the east. 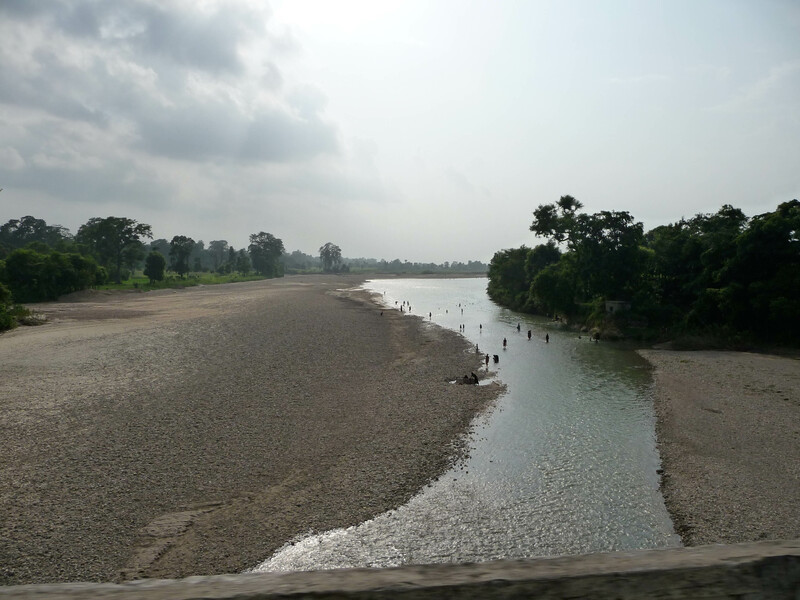 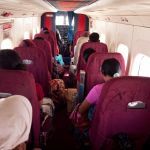 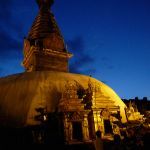 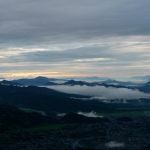 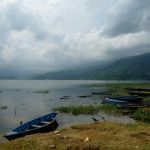 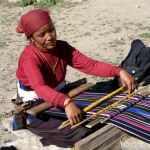 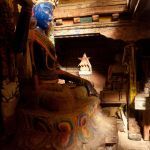 On arrival in Kathmandu we arranged the necessary permits and the next day a long bus ride brought us to Nepalganj in the southwest of the country. 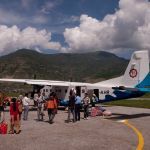 There are very few streets in the mountainous regions of Nepal, but some towns can be reached by small planes that can start and land on the very short air strips. 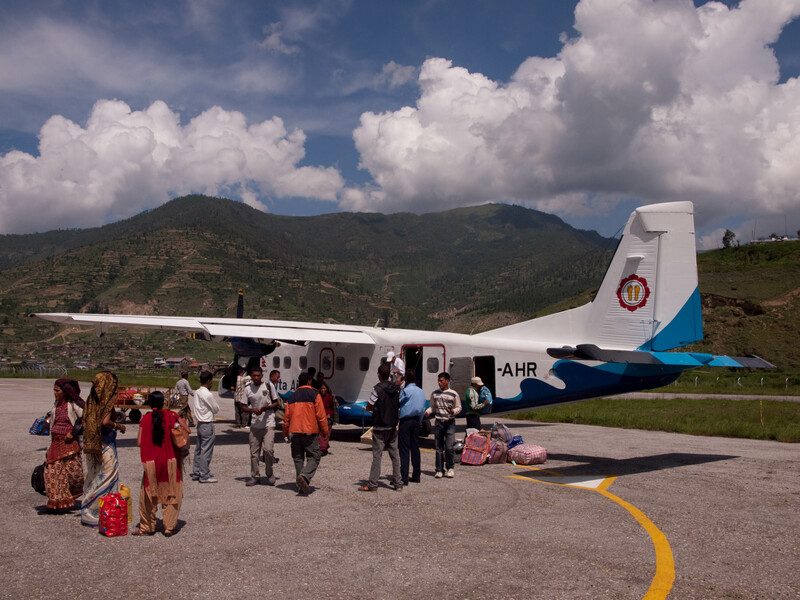 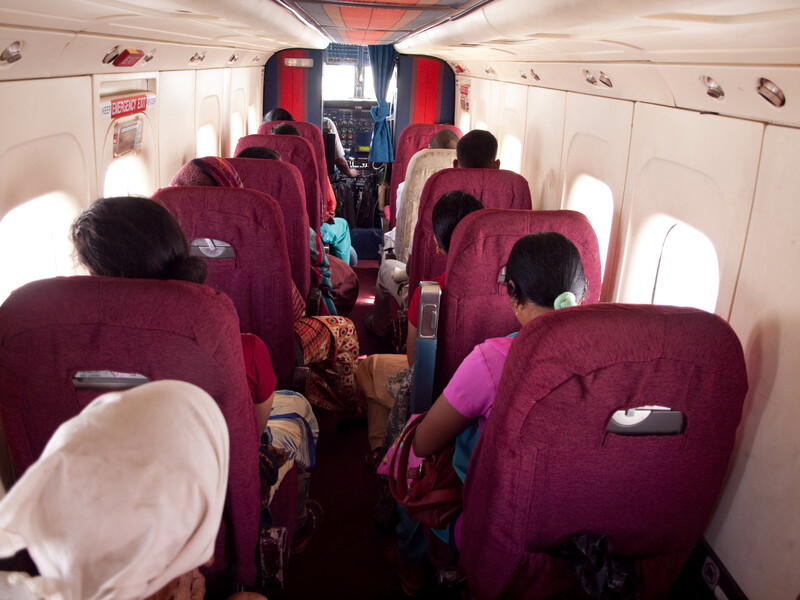 In Nepalganj we were lucky to get two seats in one of these planes to reach Jumla. 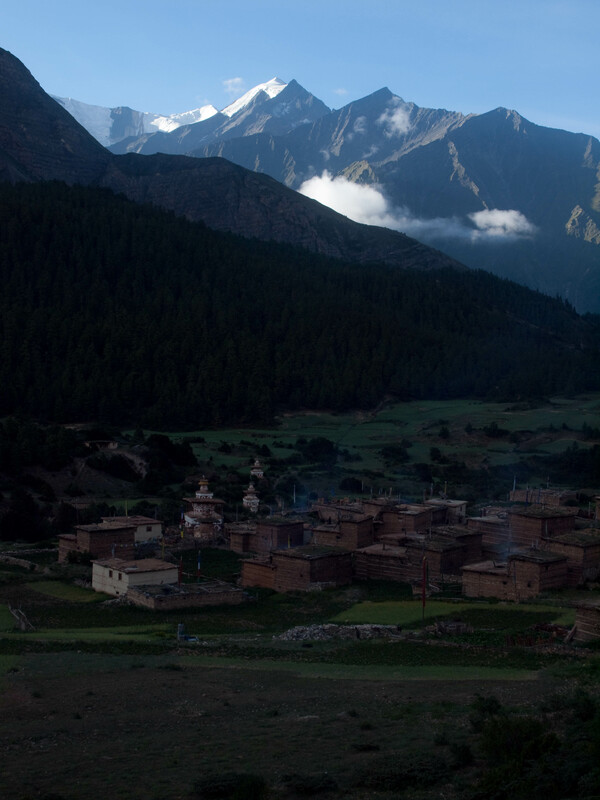 Jumla is the capital of the district with the same and lies in a green valley at an altitude of 2,514m. 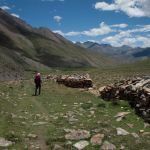 It was the start of our trek and we left the town walking eastwards. 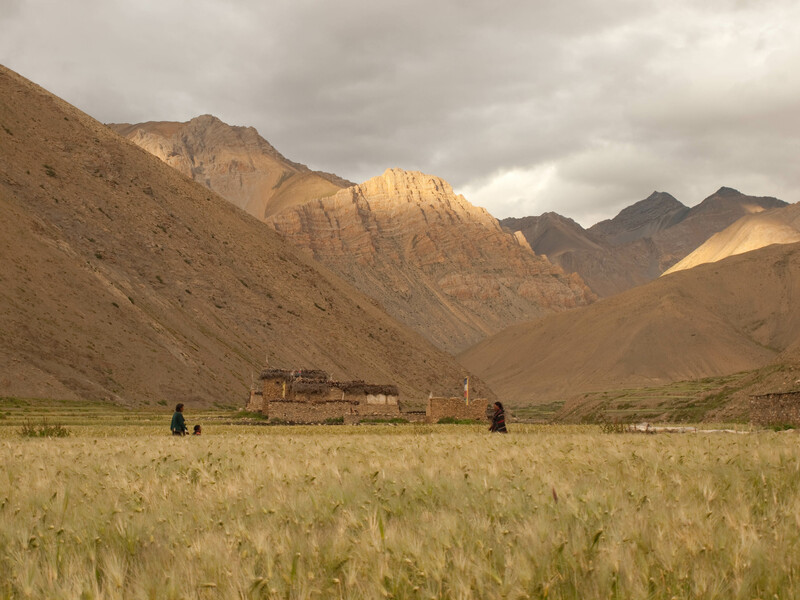 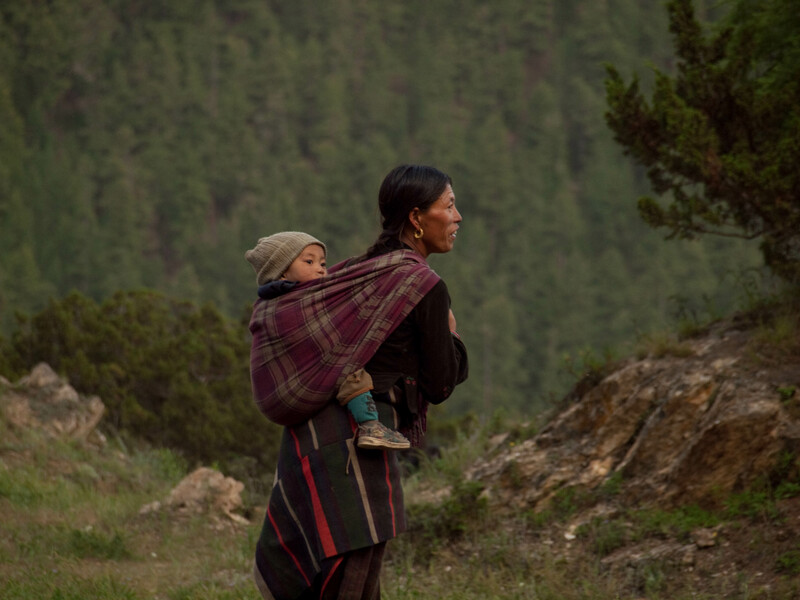 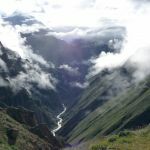 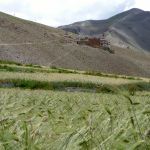 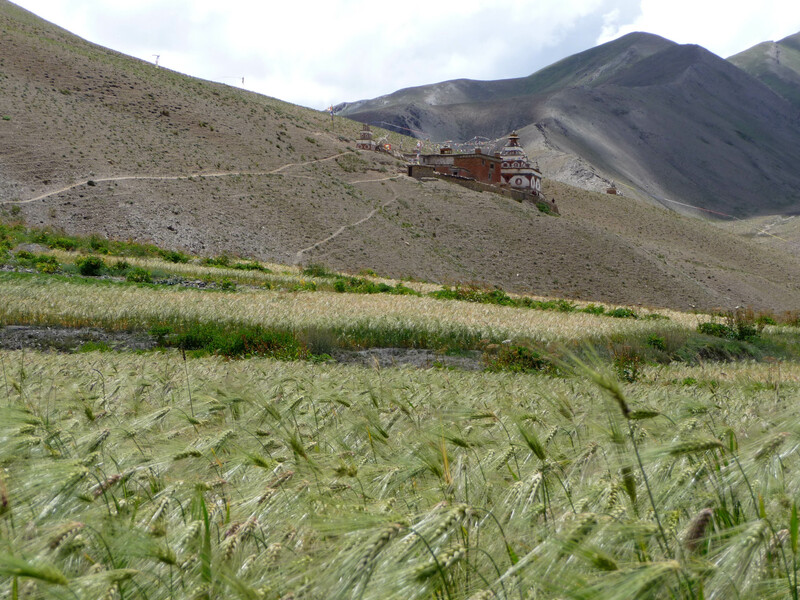 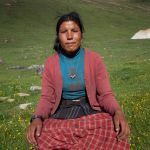 Agriculture is possible up to very high altitudes (±4,000m) and during the first few days we came through small villages in which farmers grow potatoes, buckwheat, millet, wheat, and other crops. 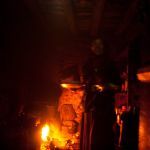 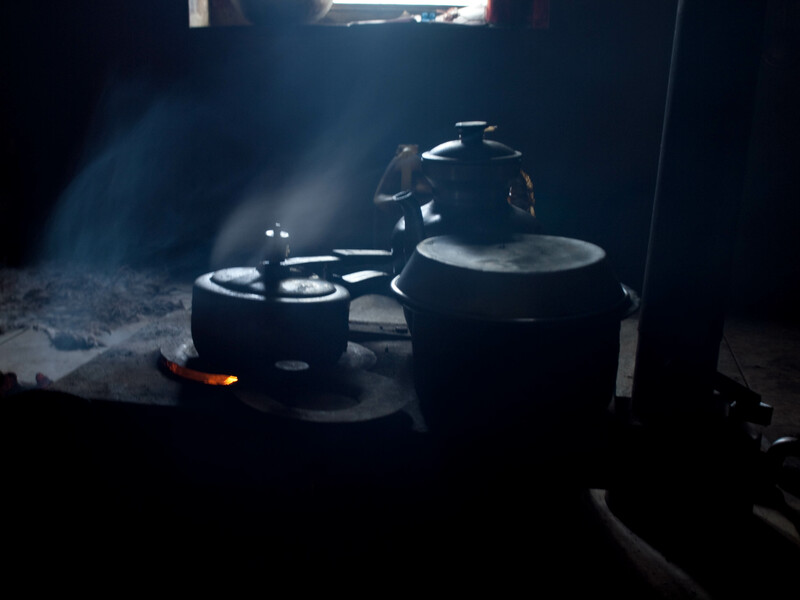 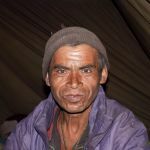 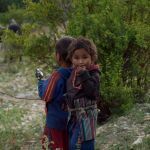 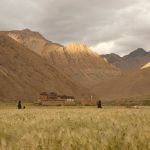 In the villages we could get food – the staple throughout the country is lentils with rice (‘Dal Bhat’) – and we could stay at local homes for the night. 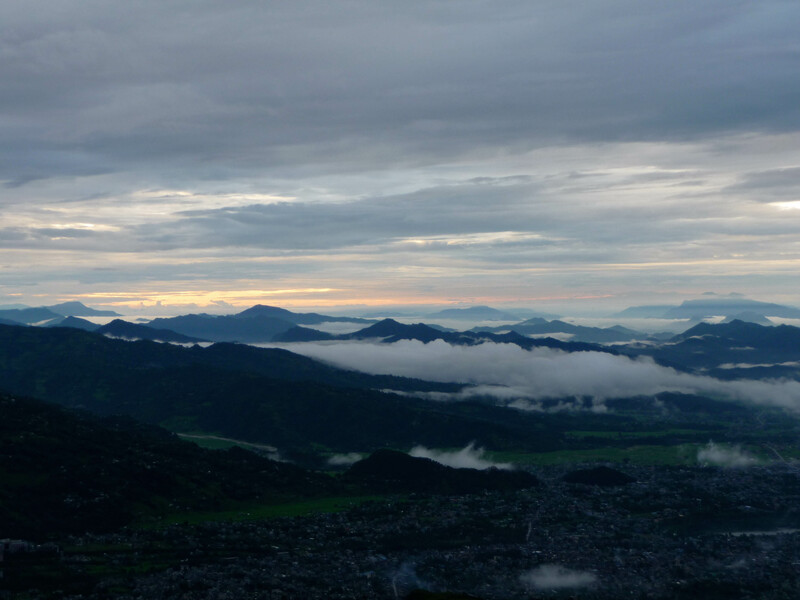 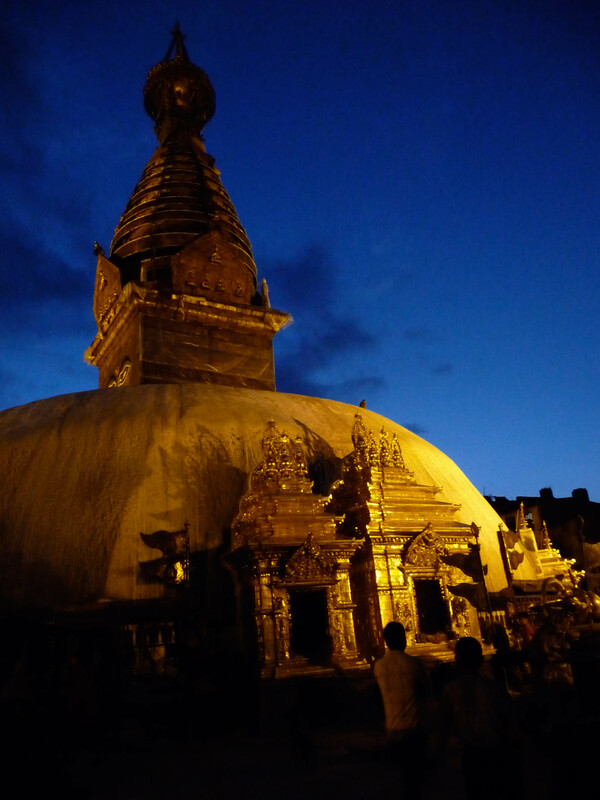 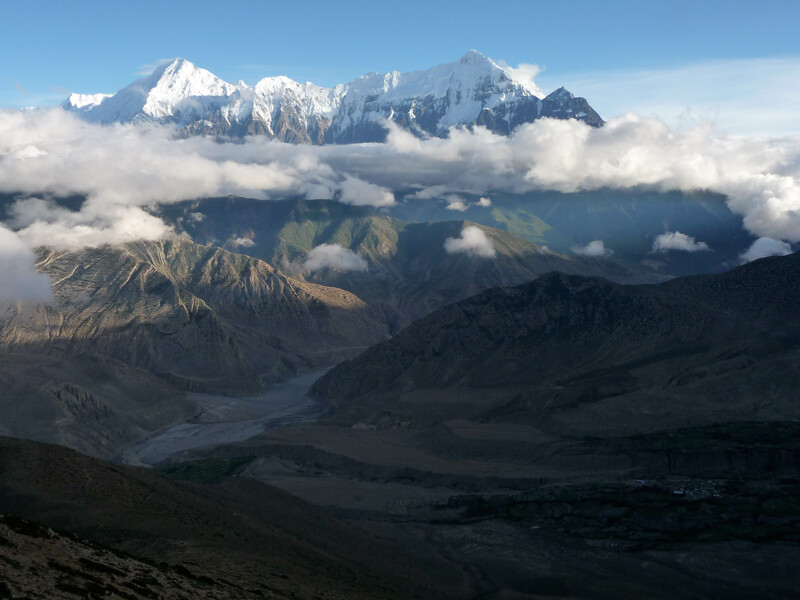 The best times to visit the Nepalese Himalaya are before and after the summer monsoon, but since we were students at the time, we were not flexible to go then. 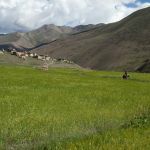 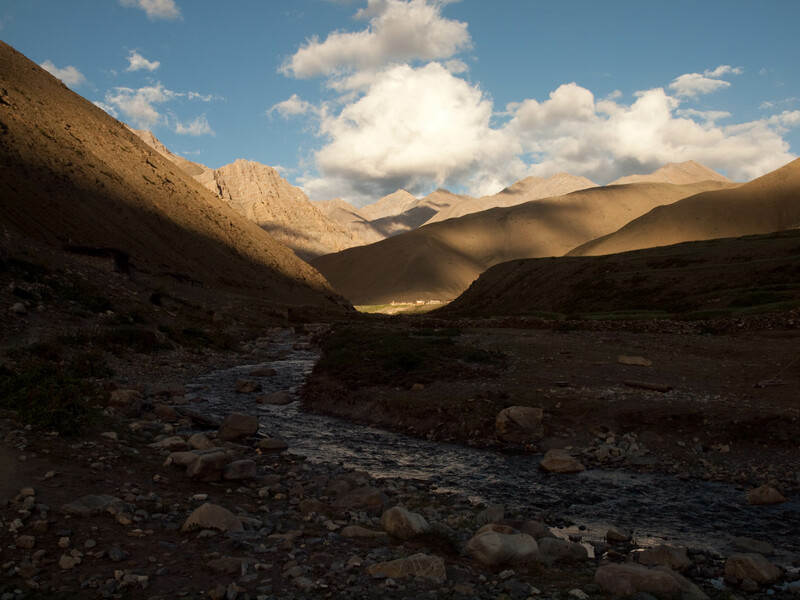 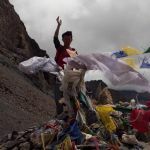 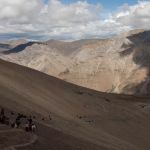 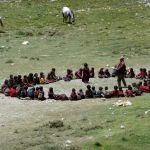 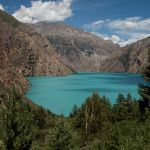 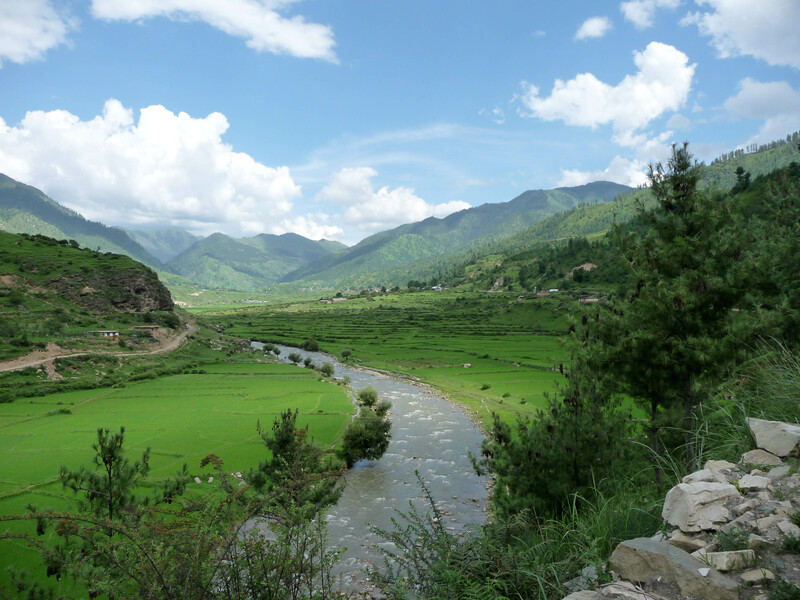 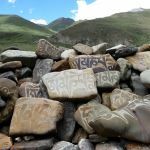 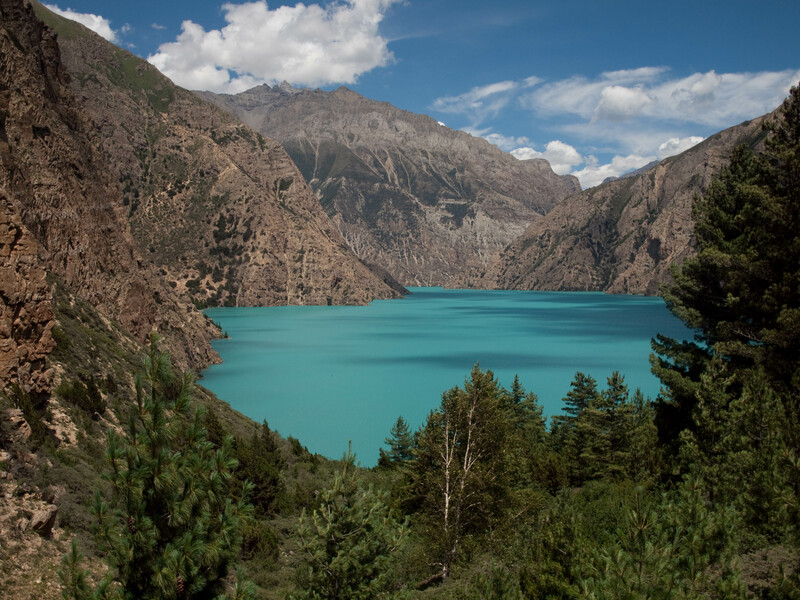 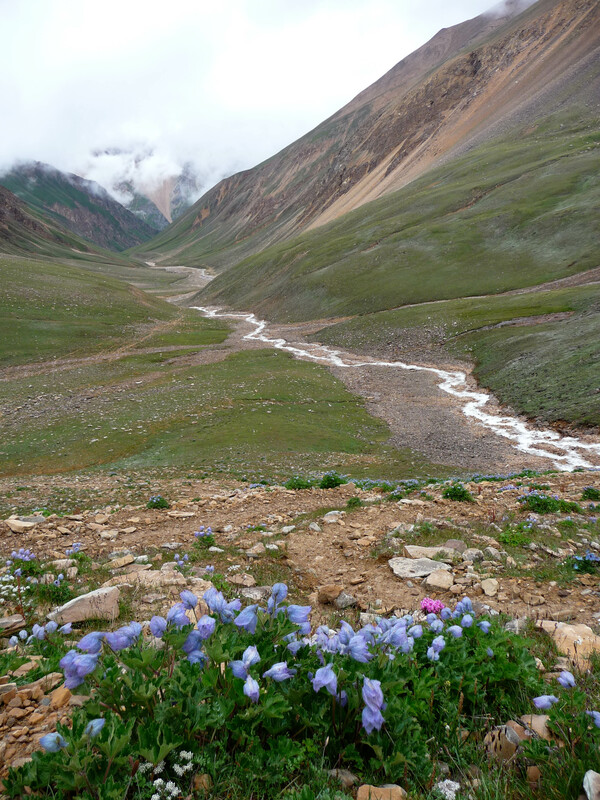 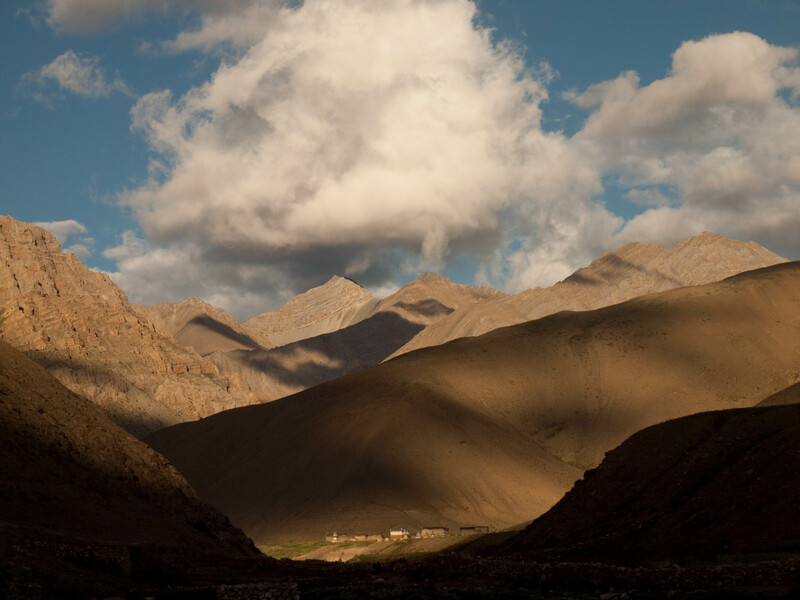 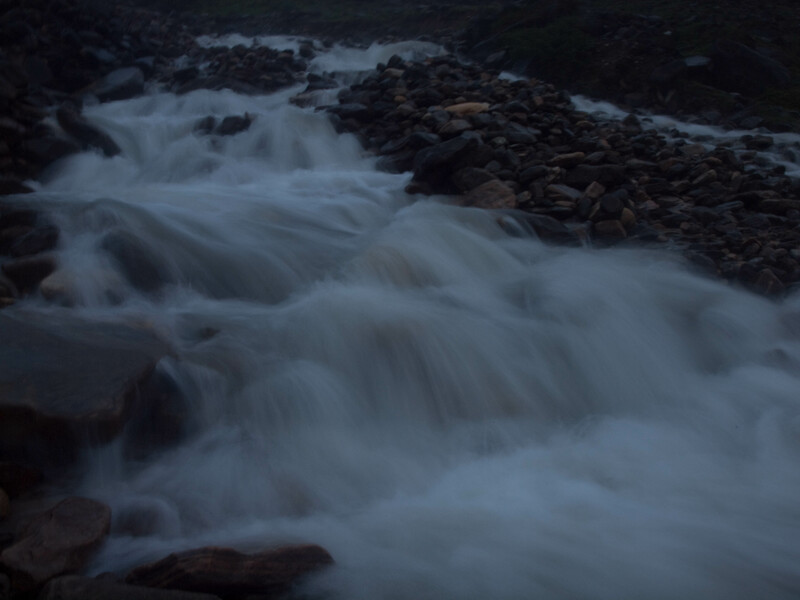 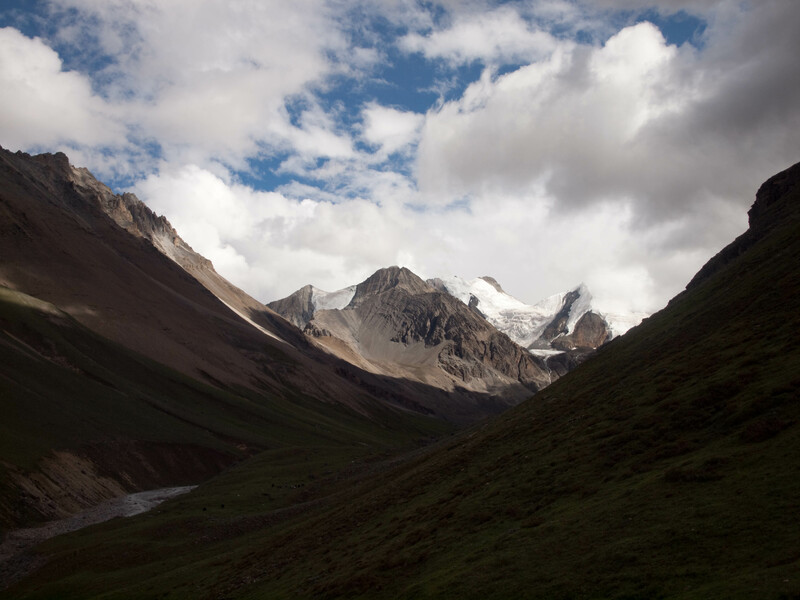 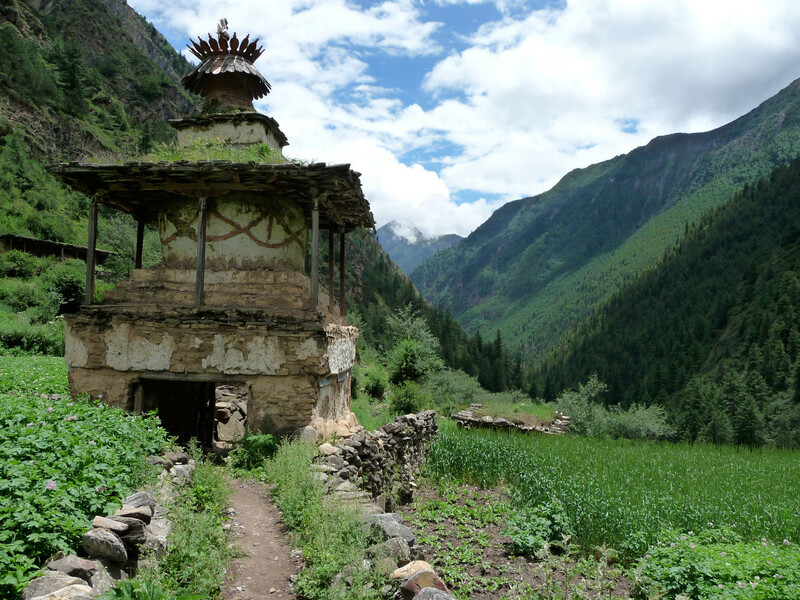 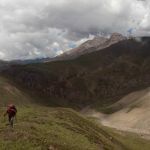 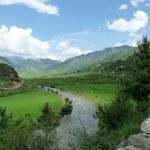 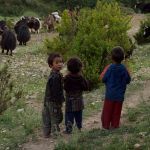 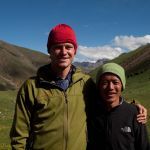 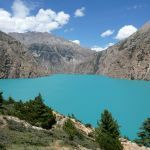 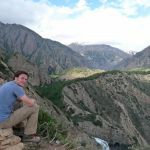 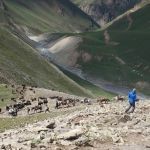 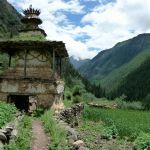 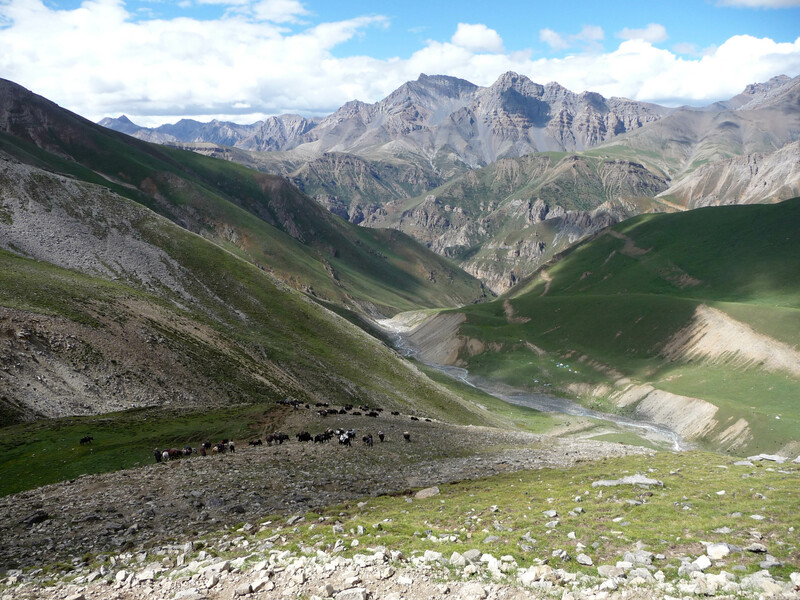 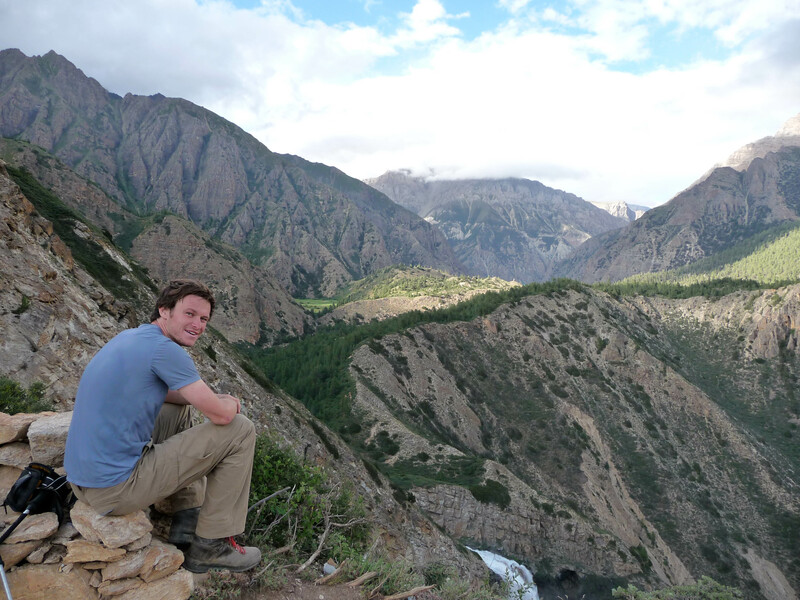 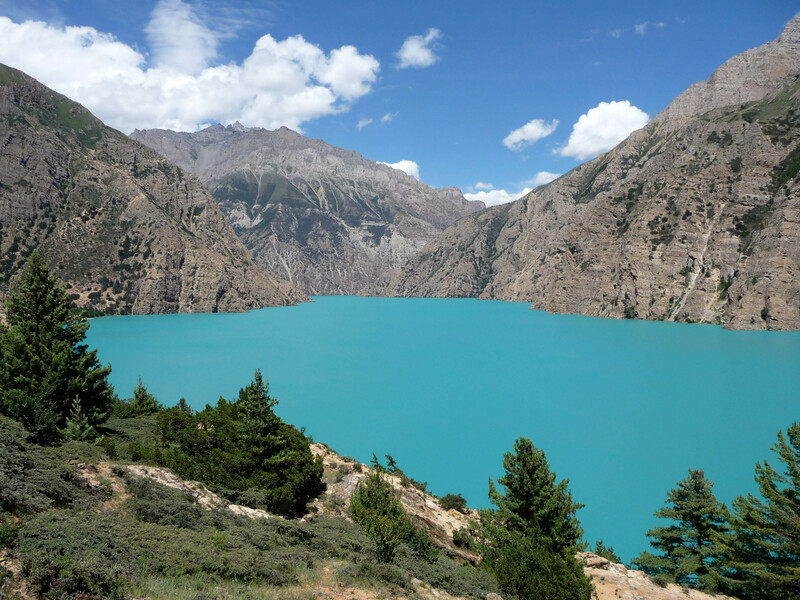 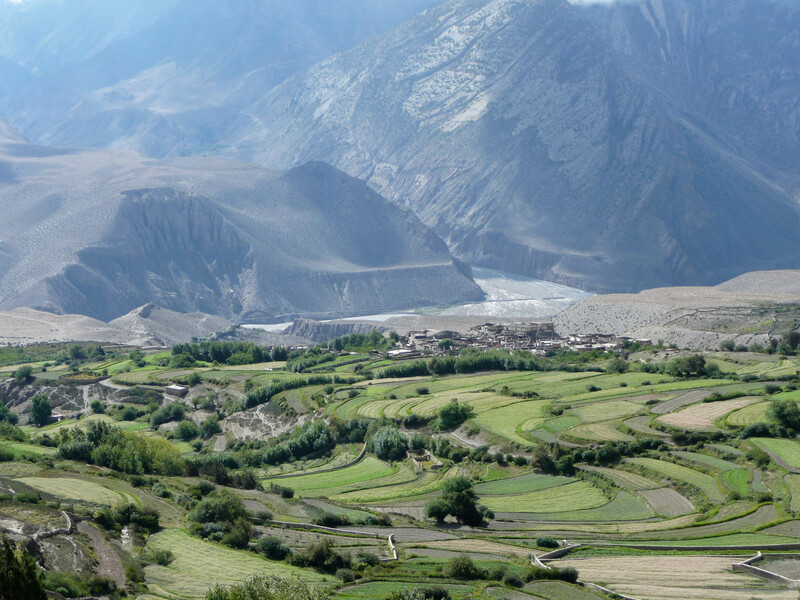 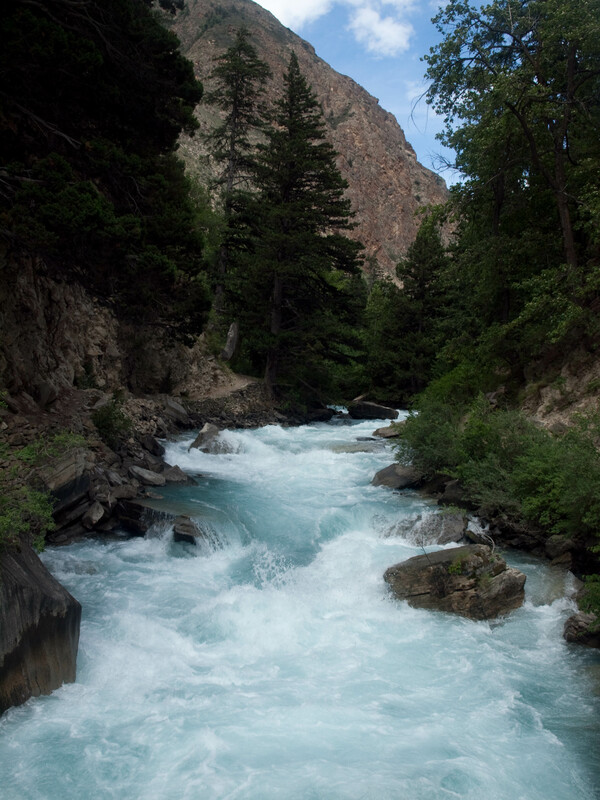 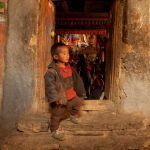 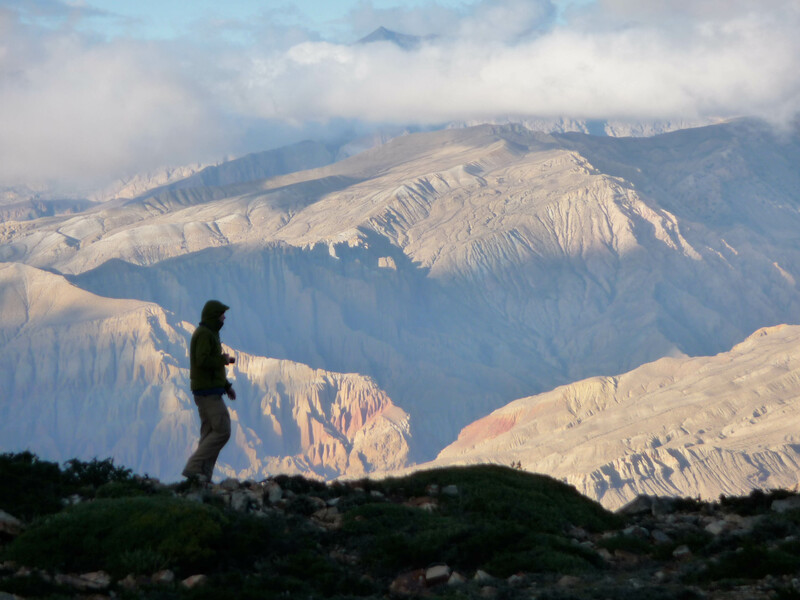 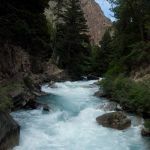 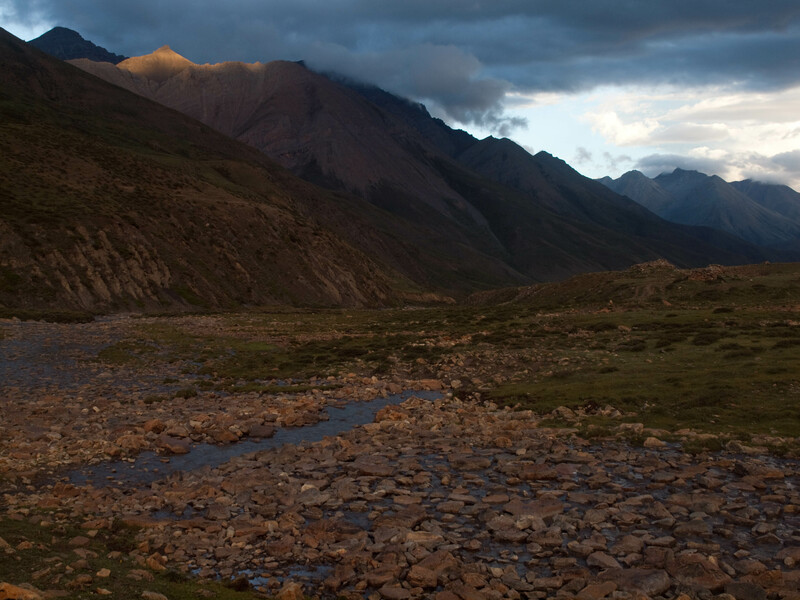 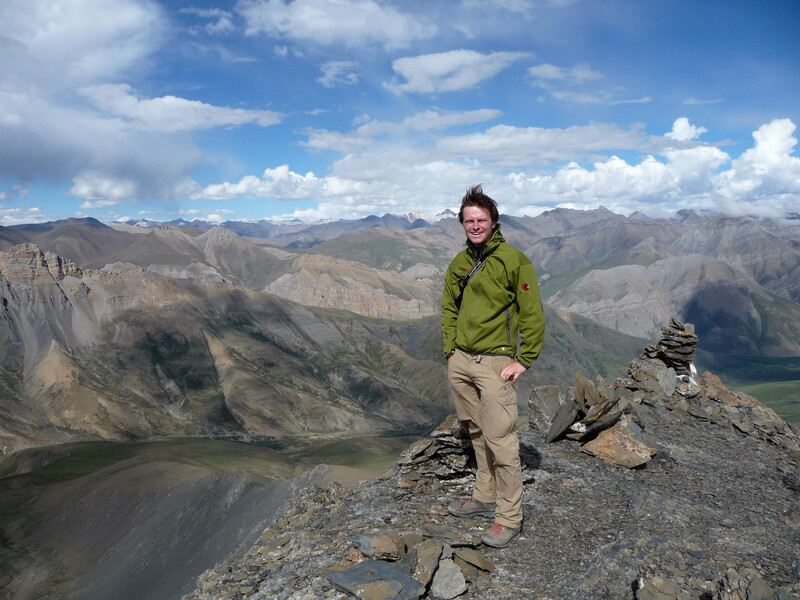 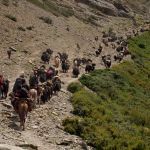 Part of the reason why we decided to go to the Dolpo region was that the northern parts are in the rainshadow of the Himalayas and do not get as wet as the southfacing slopes of the mountains. 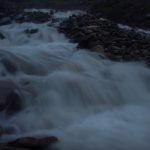 However, on the first few few days we were still quite low and got very wet. 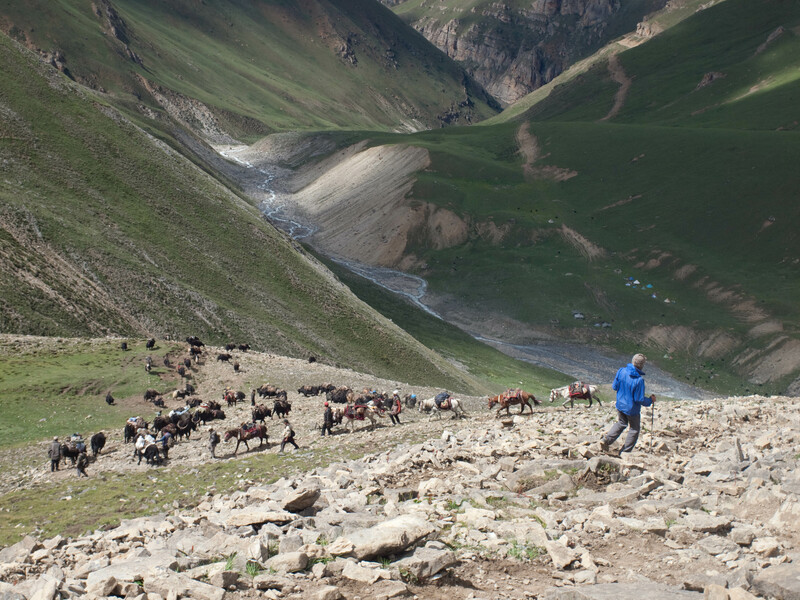 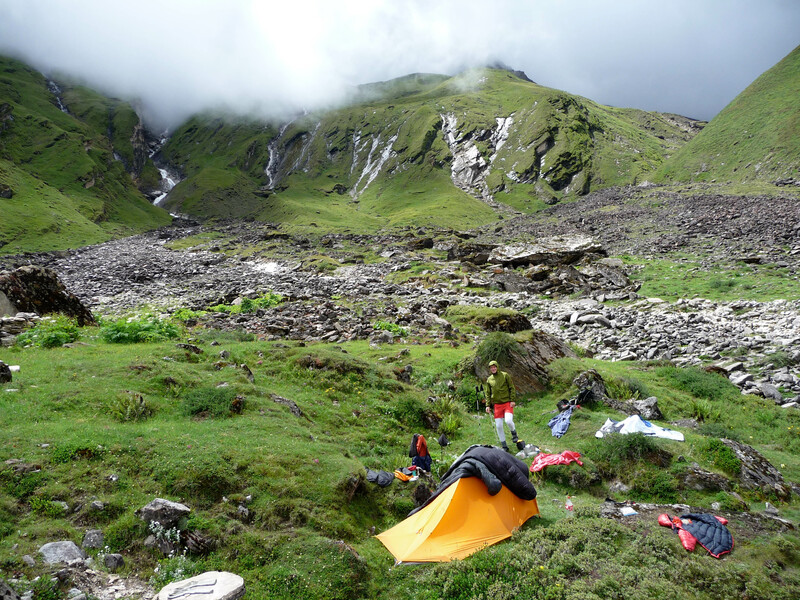 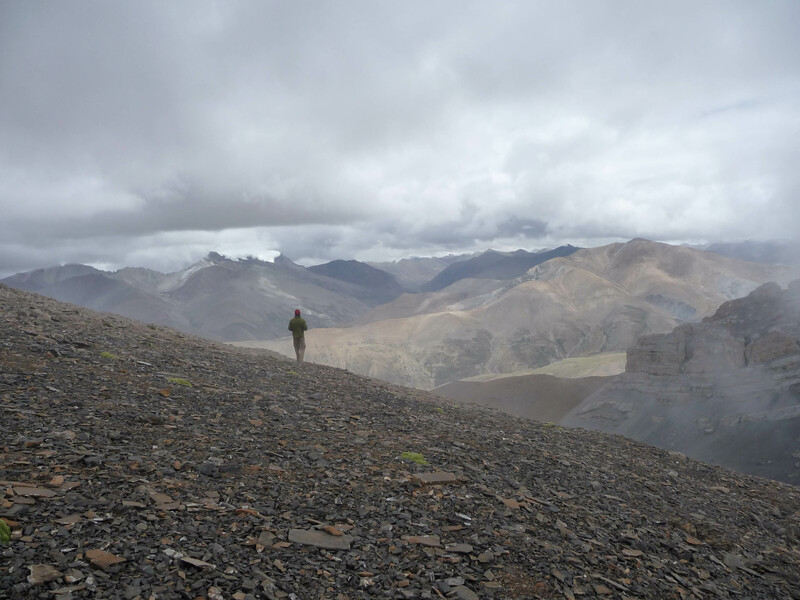 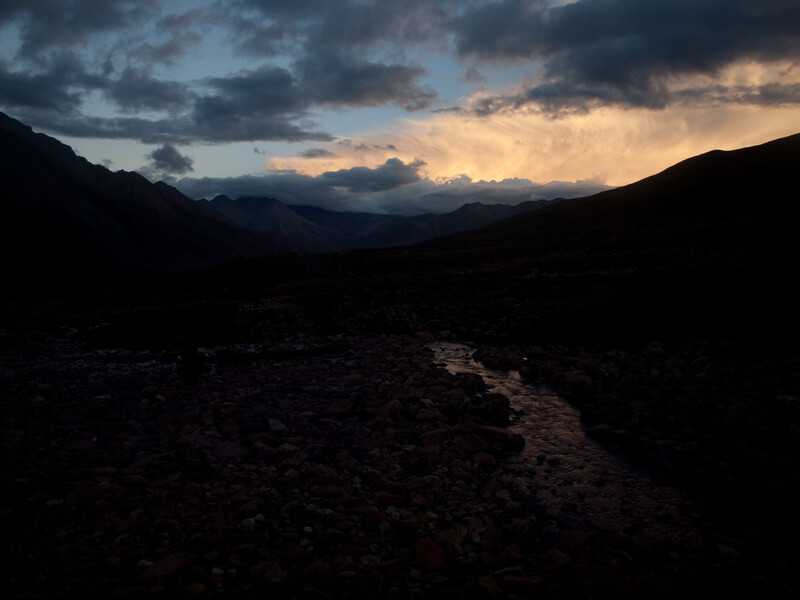 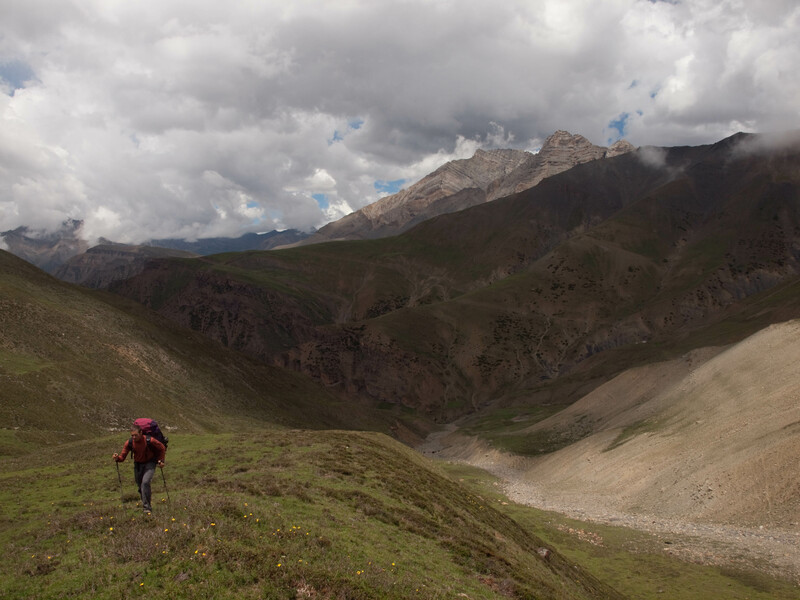 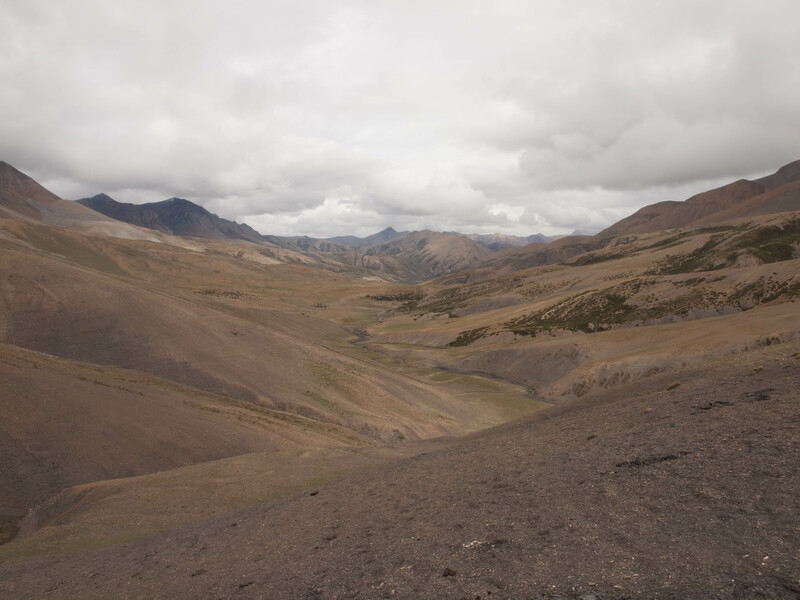 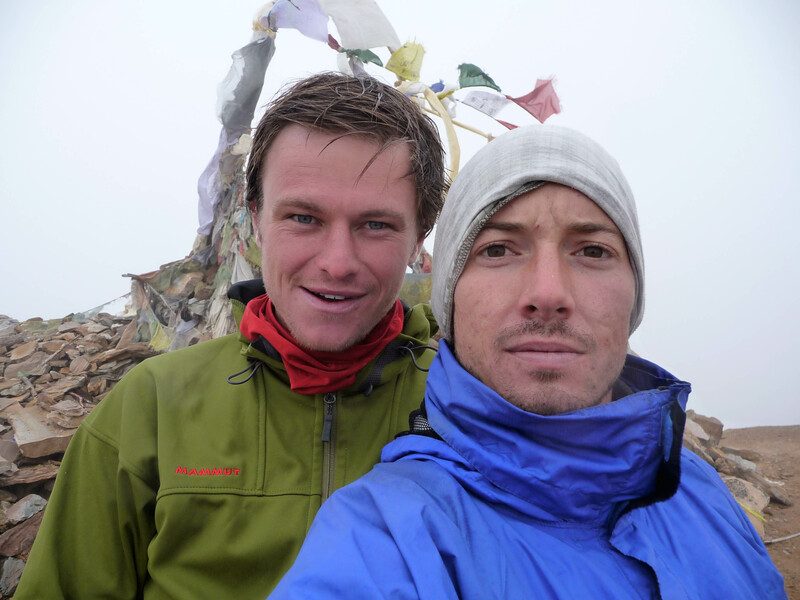 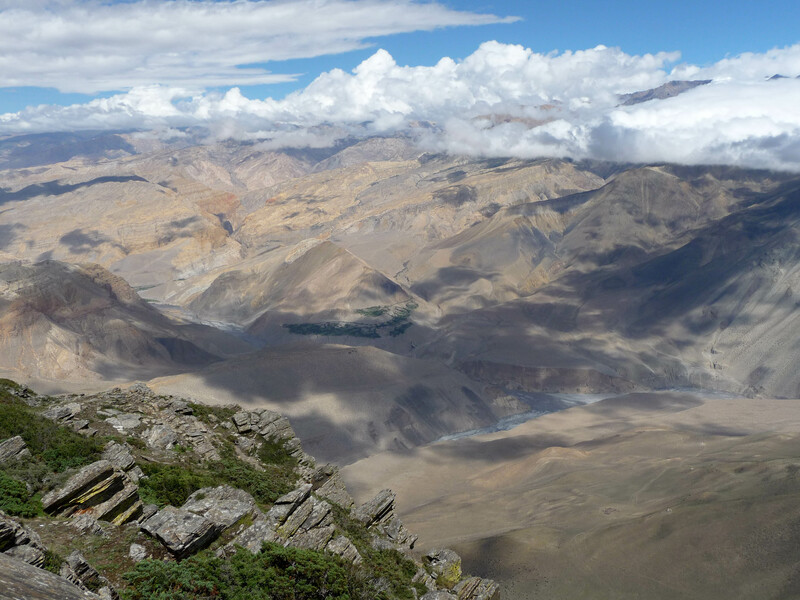 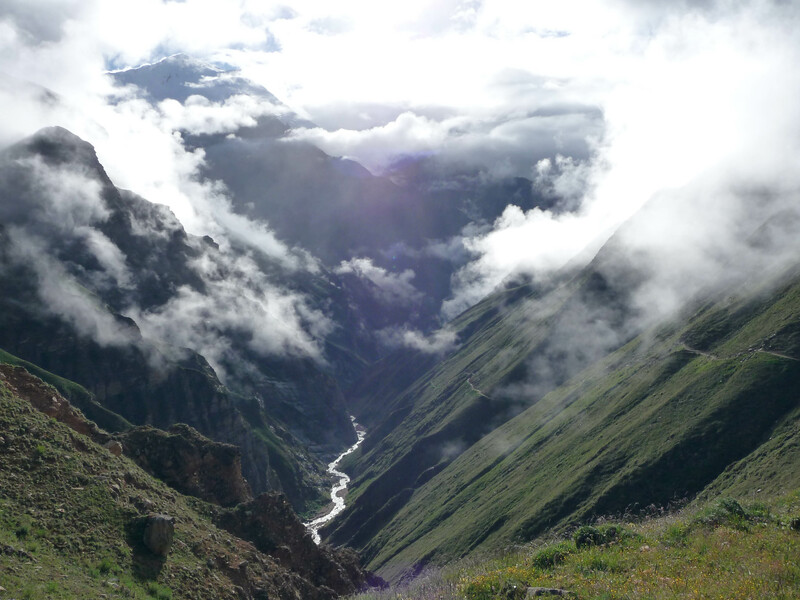 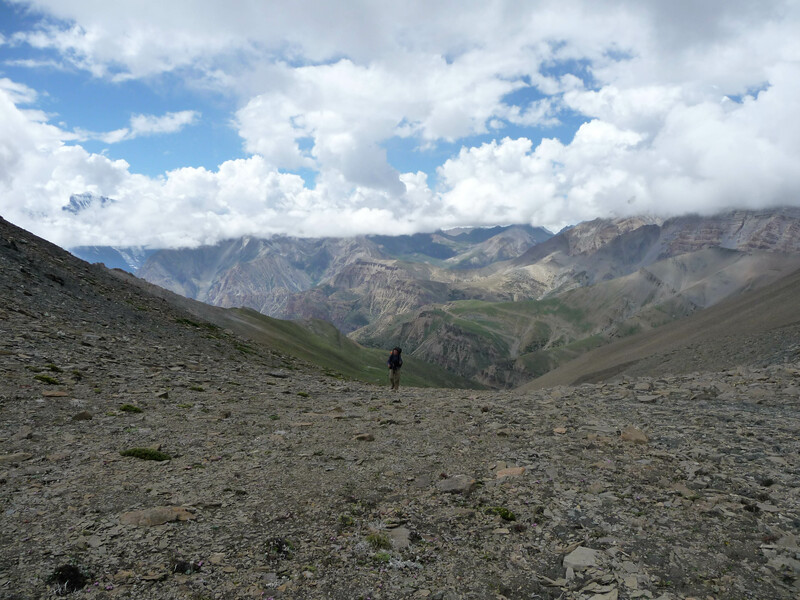 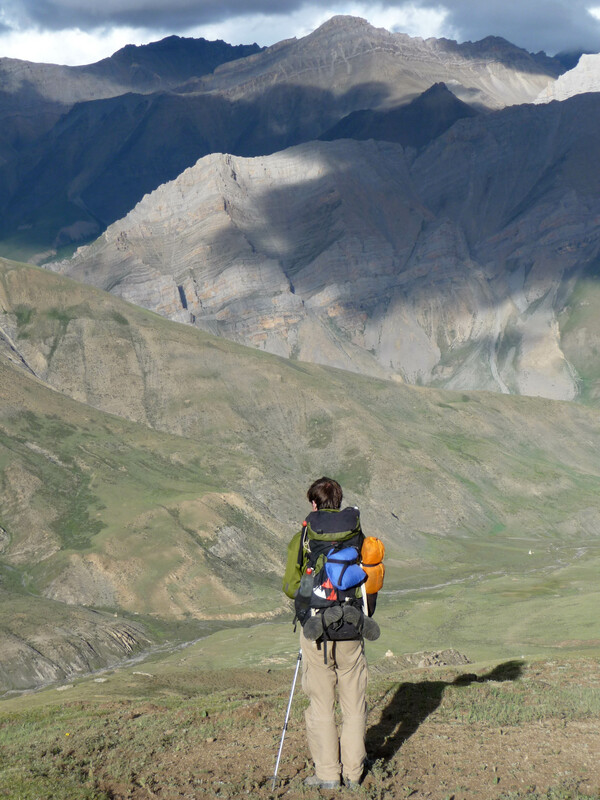 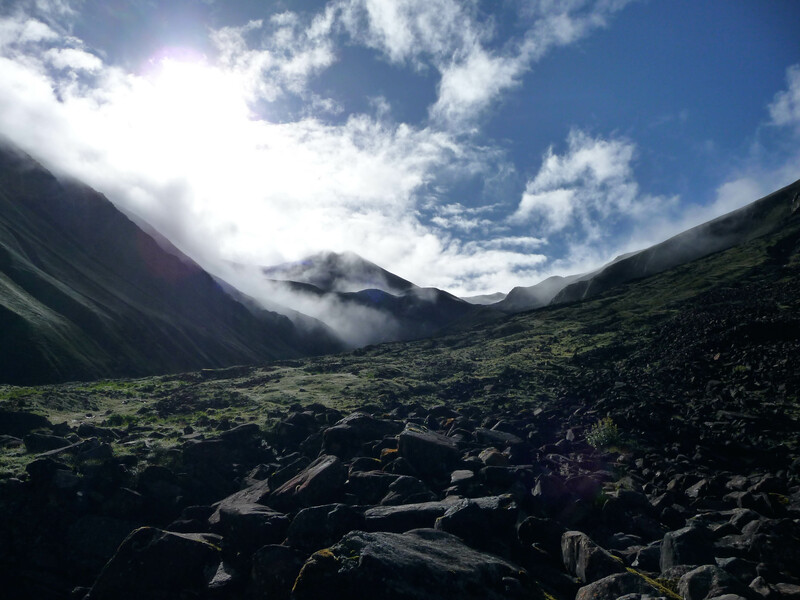 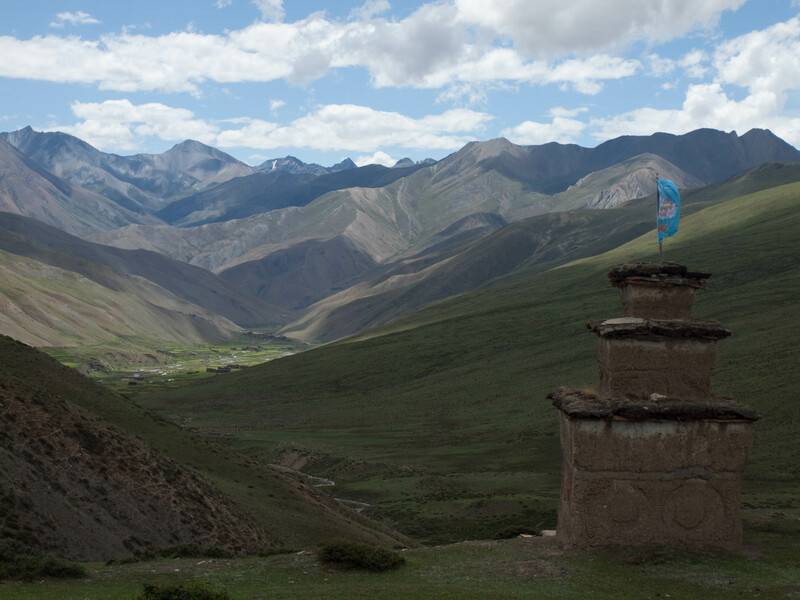 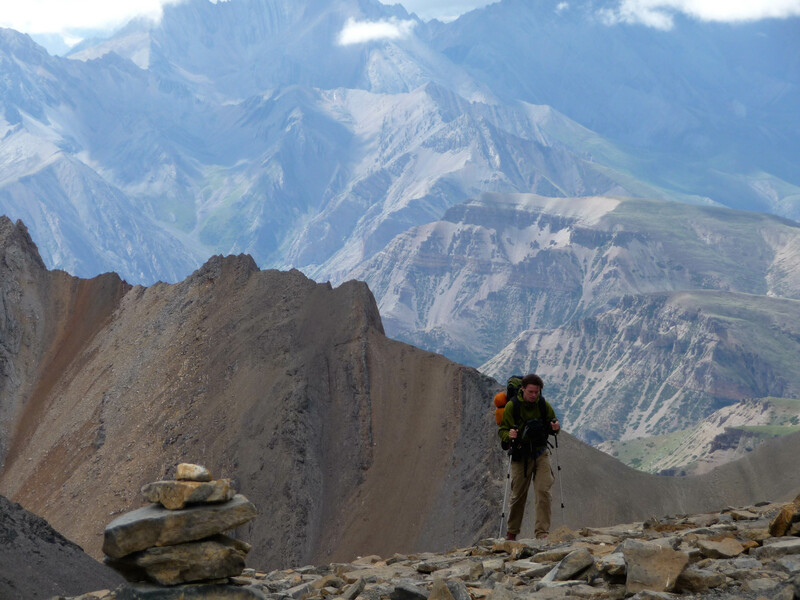 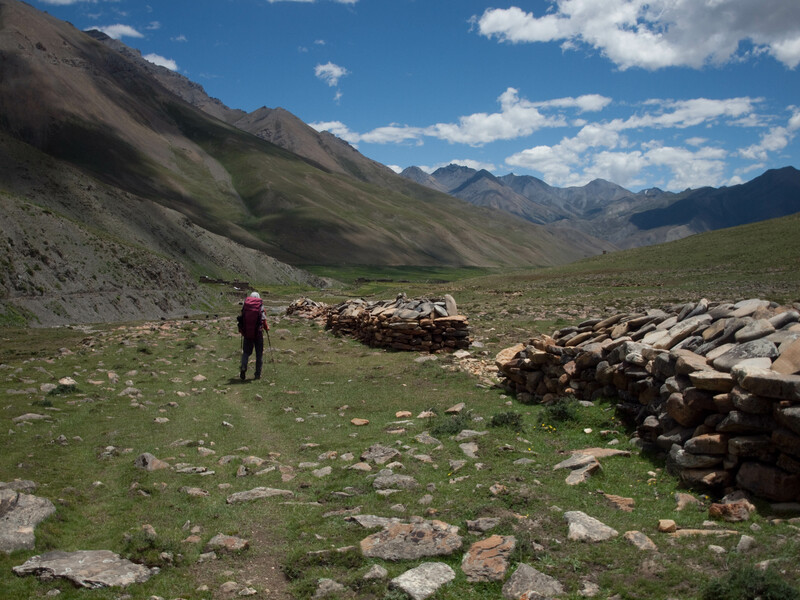 The ascent of our first higher pass – the Kagmara La – was particularly unpleasant. 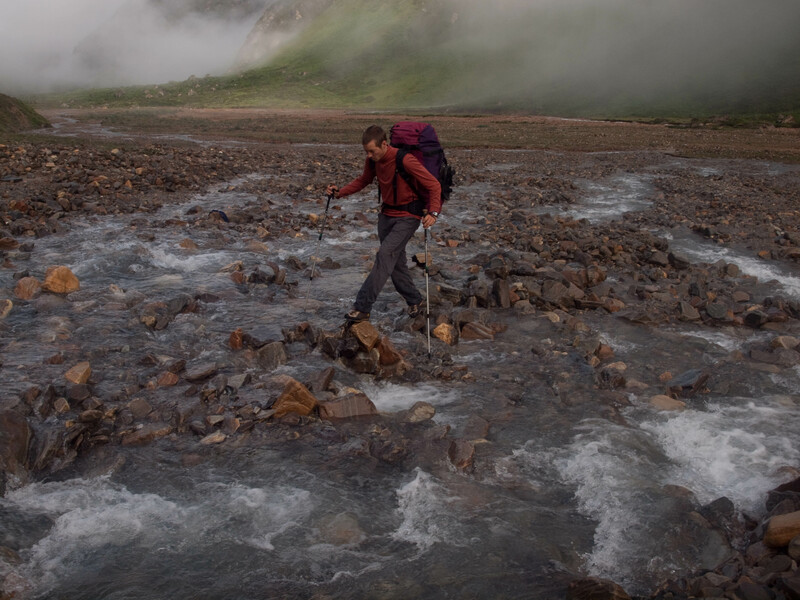 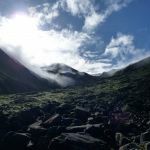 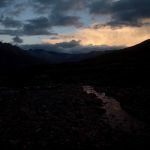 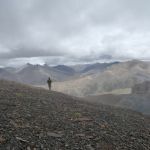 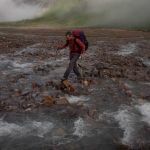 It was raining heavily, visibility was low, and as the rain and the runoff from the glaciers was increasing the size of the rivers it became difficult to find our way up and cross the 5,115m pass. 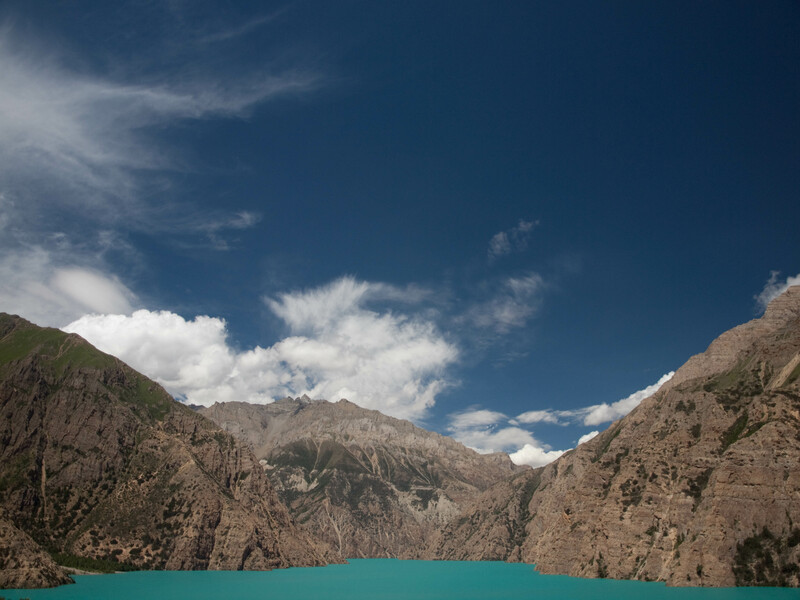 From the pass it was less than two days to the Phoksundo Lake. 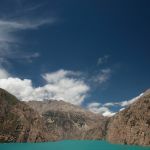 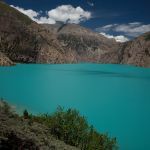 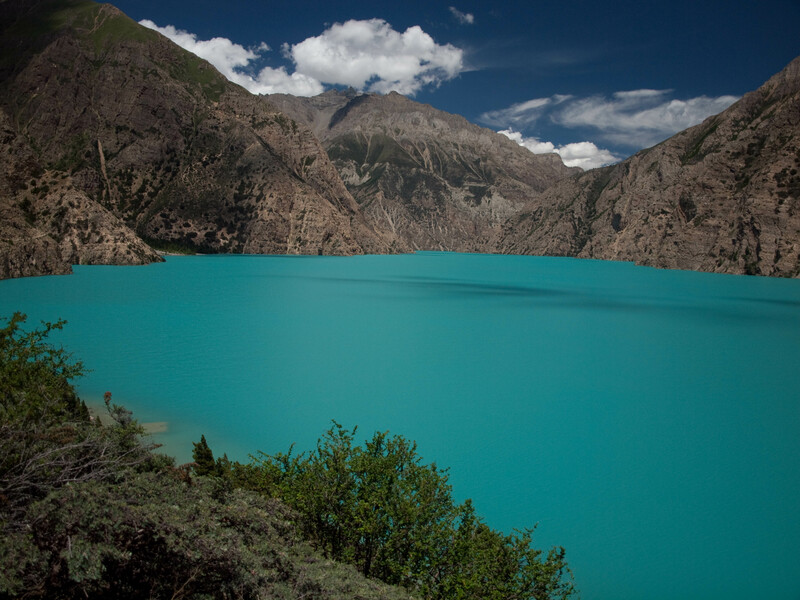 I did not use any filter or photoshop for the pictures in the gallery; the large mountain lake really has this unbelievable turquoise color! 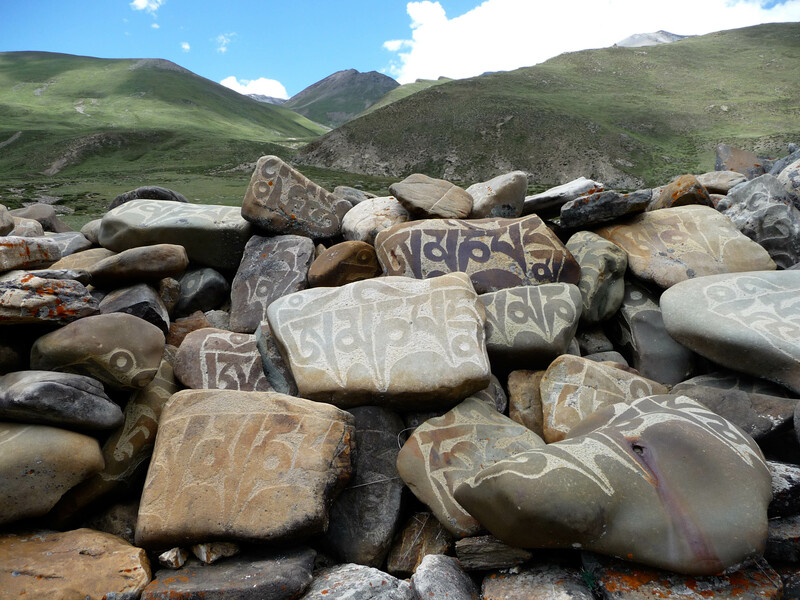 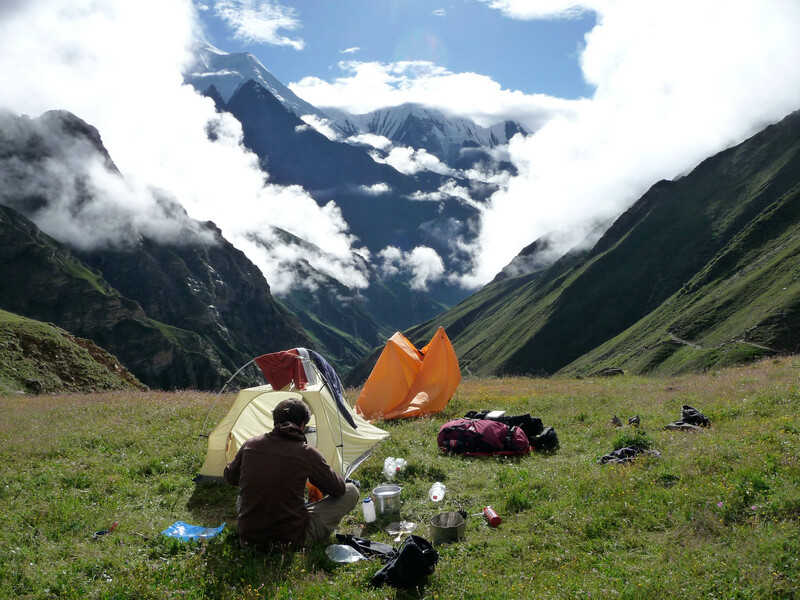 We put up our tent on the shore of Phoksundo and decided to rest here for a day. 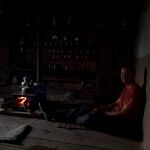 In the evening we met a very friendly couple who lived in the nearby village of Ringmo where we had proper meal again. 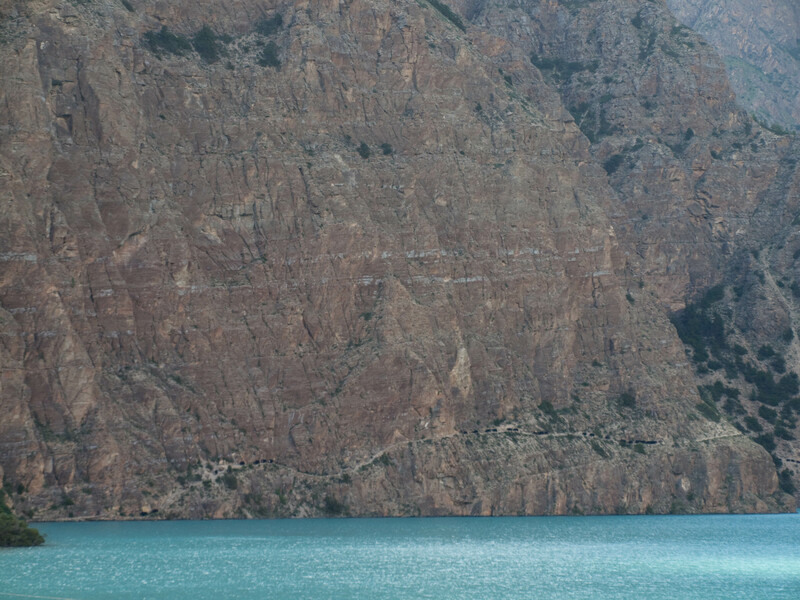 On our rest day we explored the area, visited a monastery, and had a bath in the ice-cold waters of the lake. 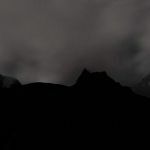 But on the afternoon we were in for a big surprise! 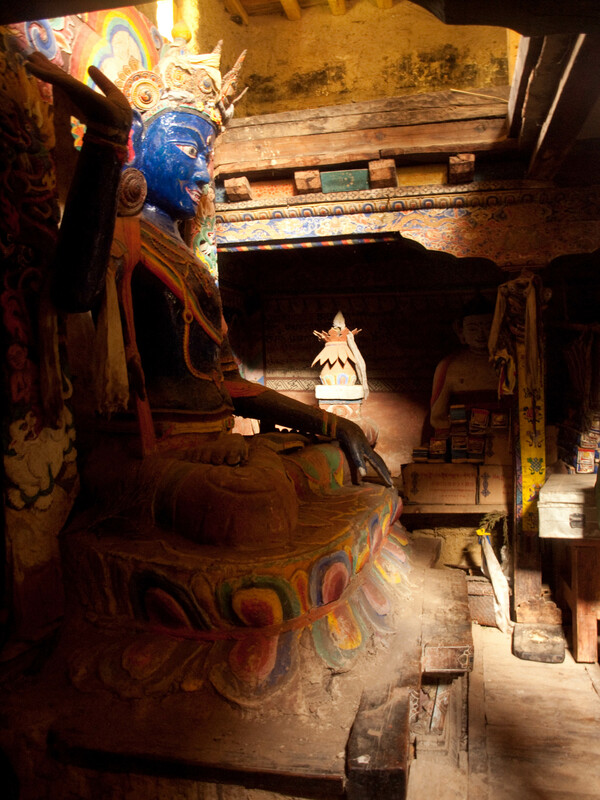 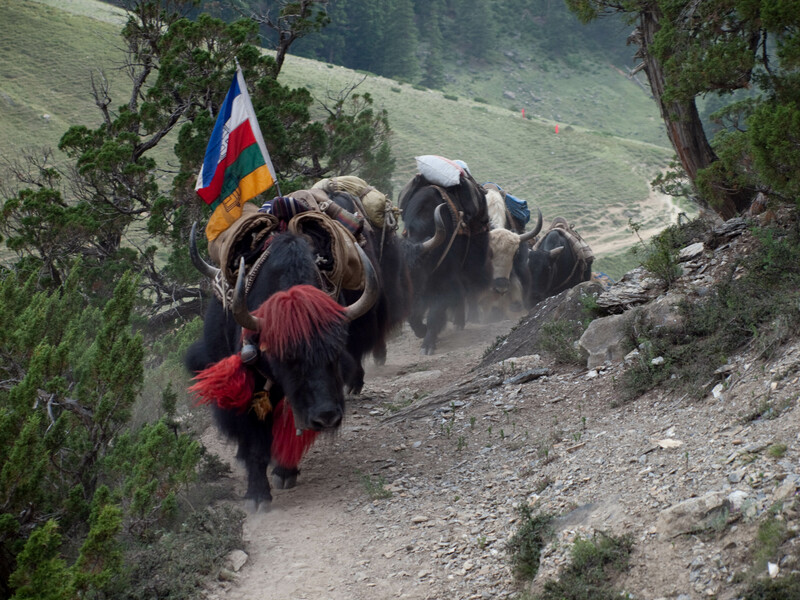 In preparation we have heard of the caravans that are travelling though the regions to trade with Tibet. 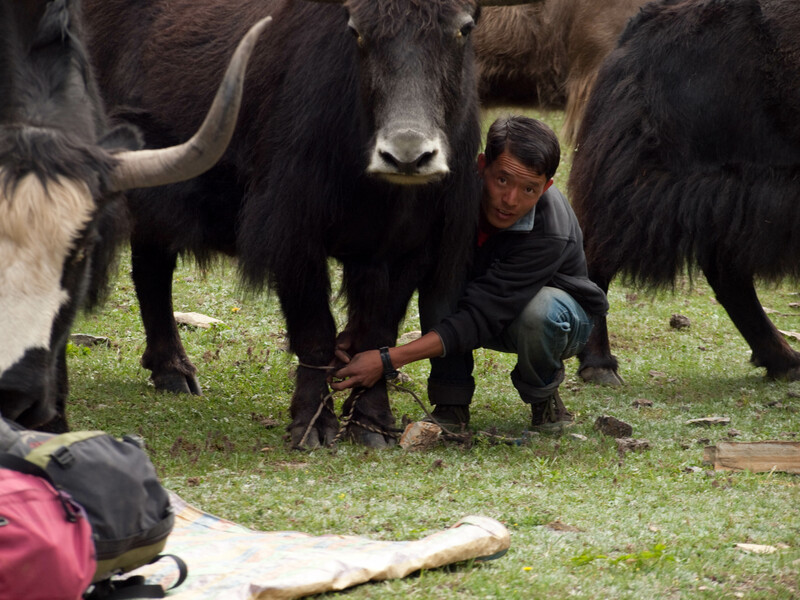 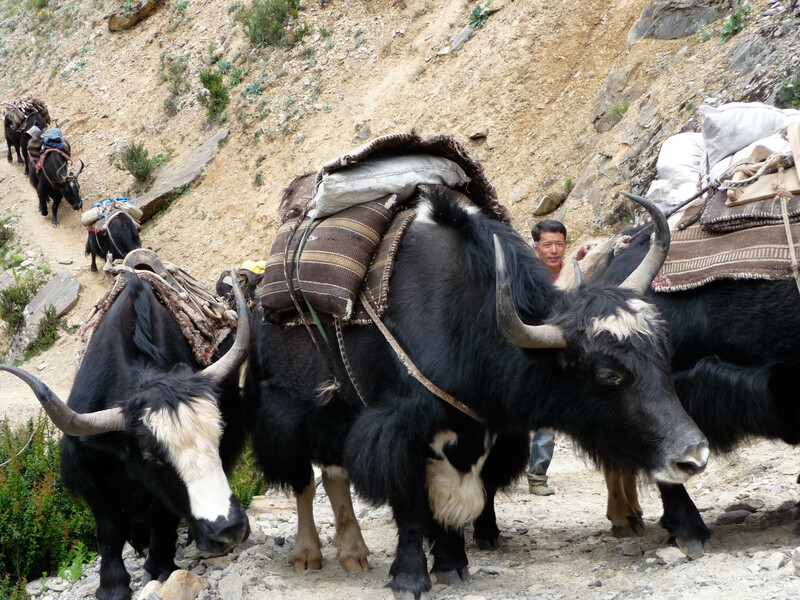 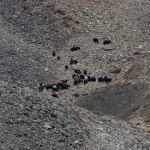 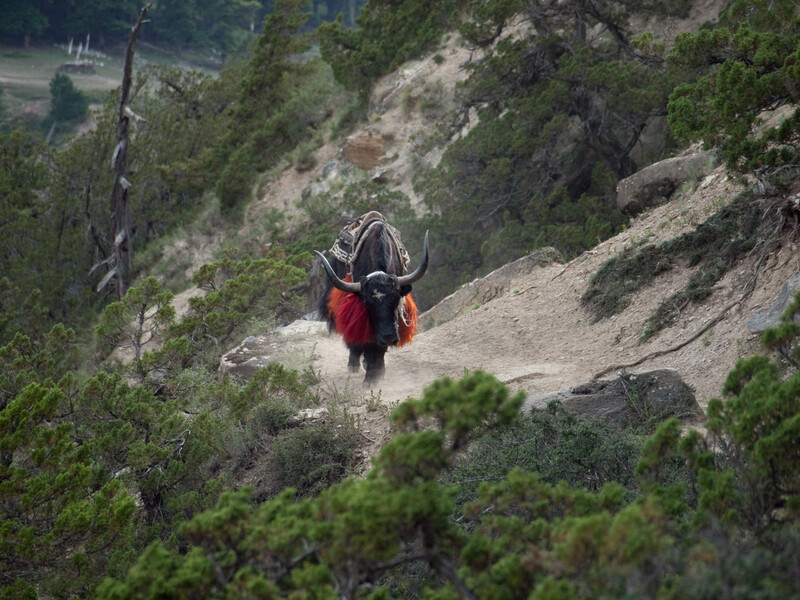 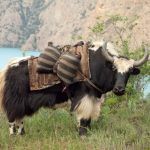 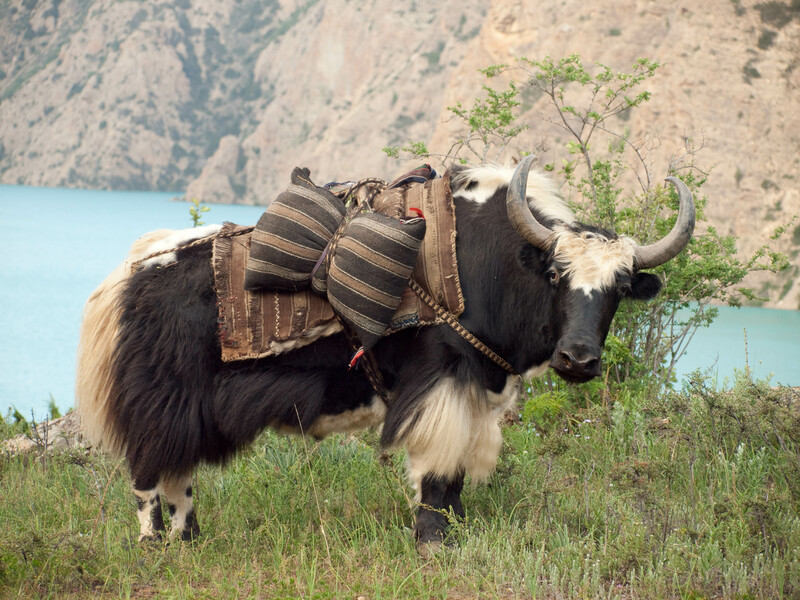 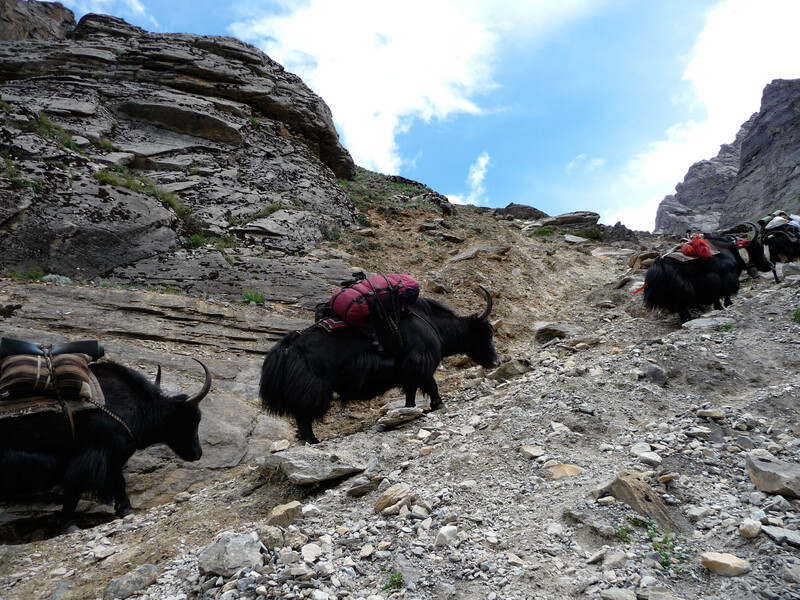 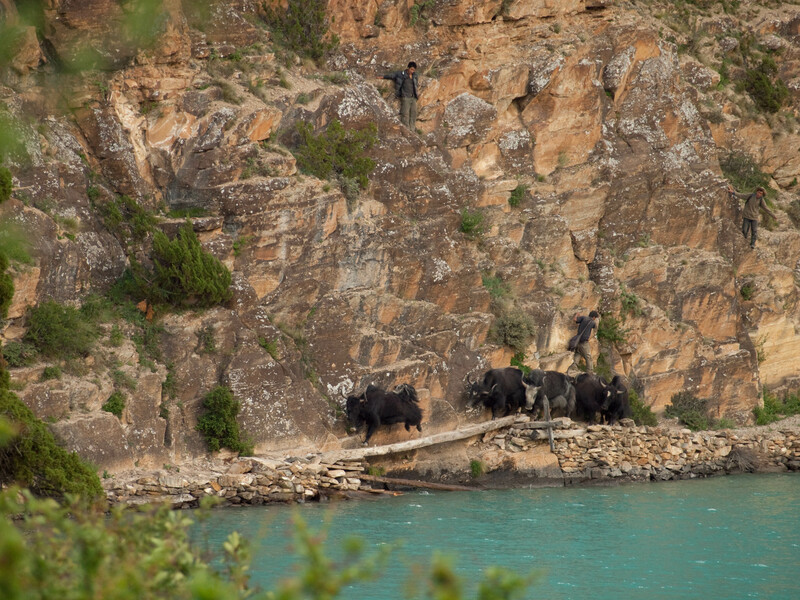 The pack animals for these trading expeditions are yaks – long-haired bovids that weigh up to more than half a ton. 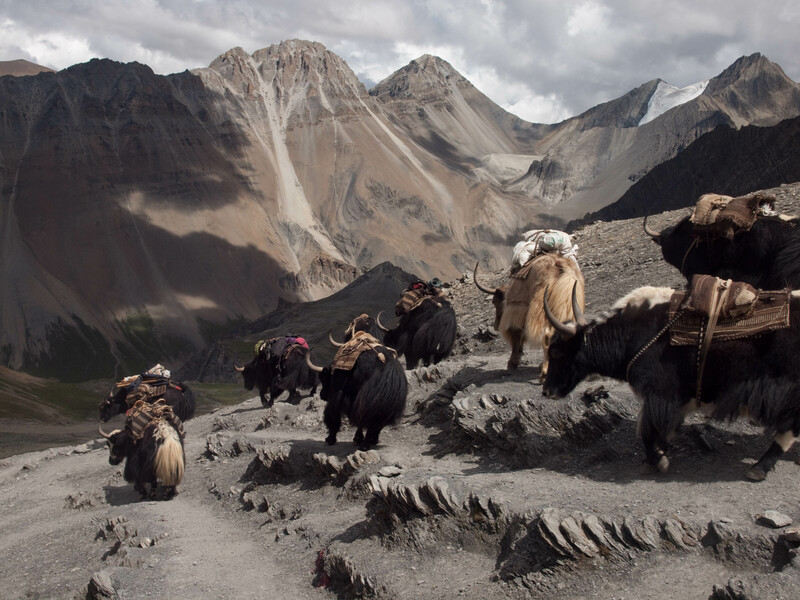 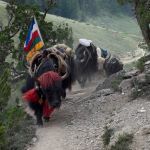 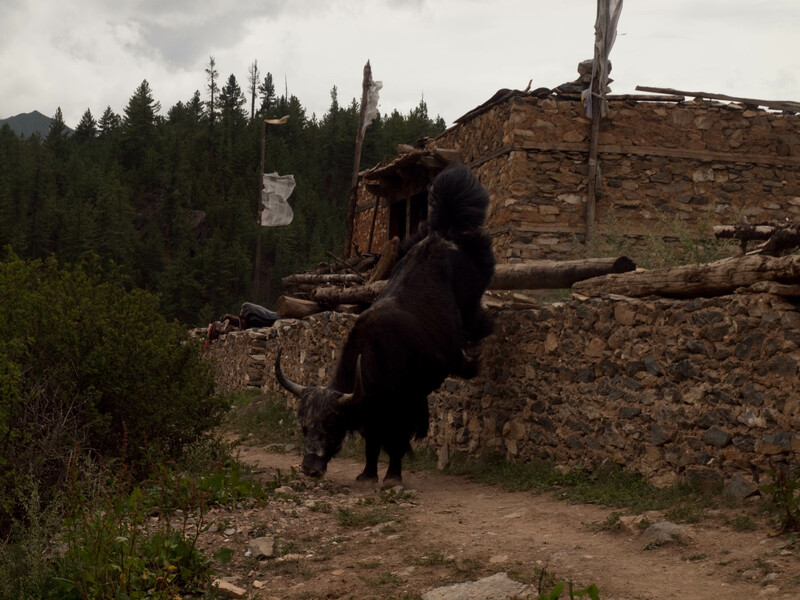 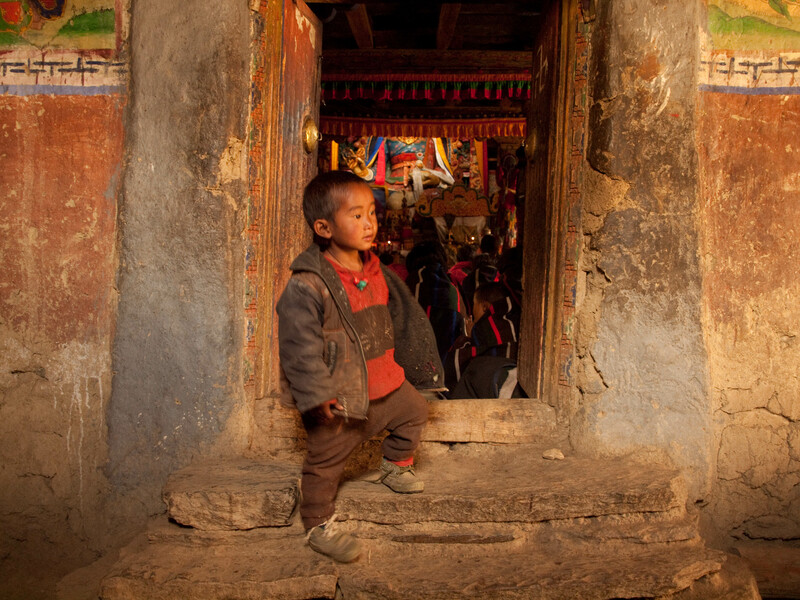 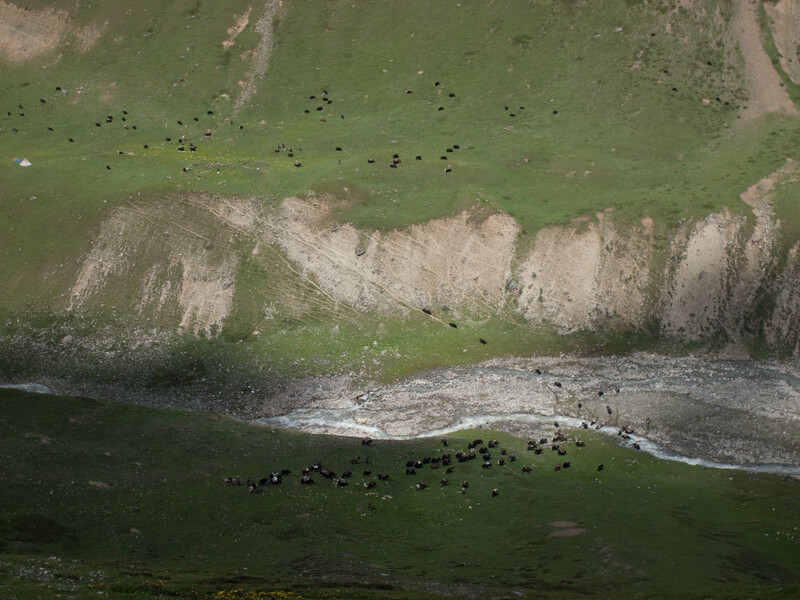 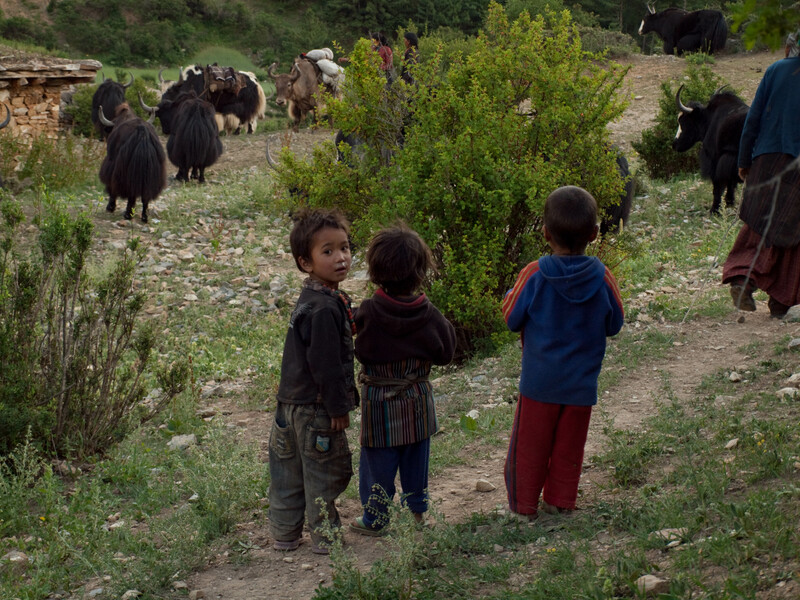 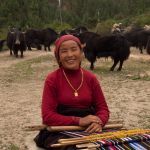 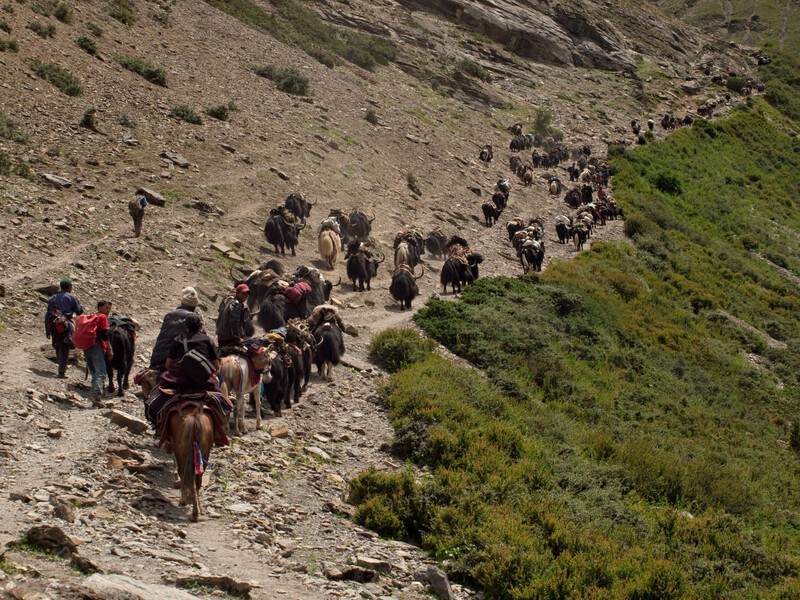 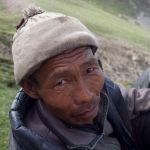 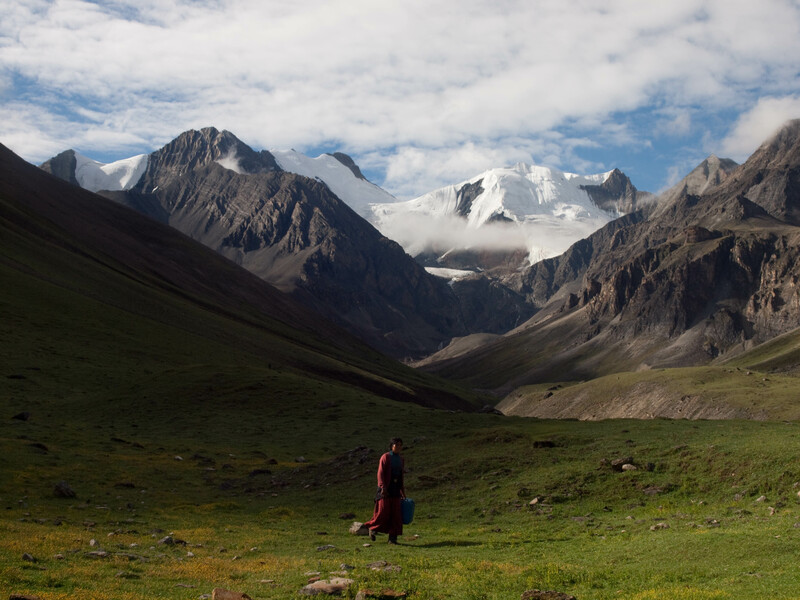 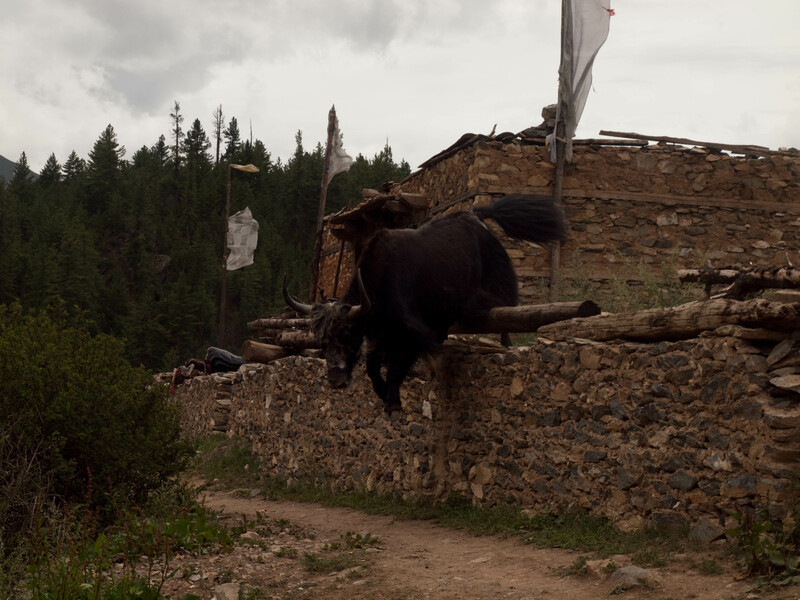 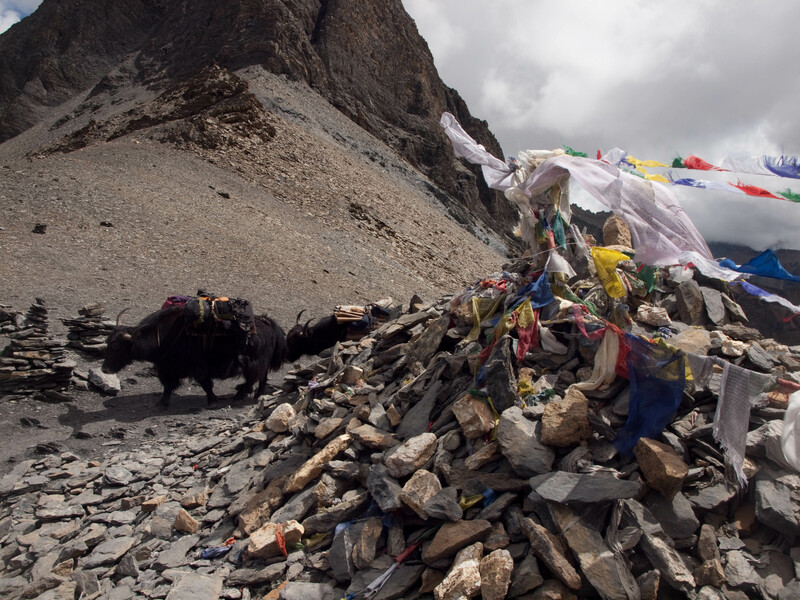 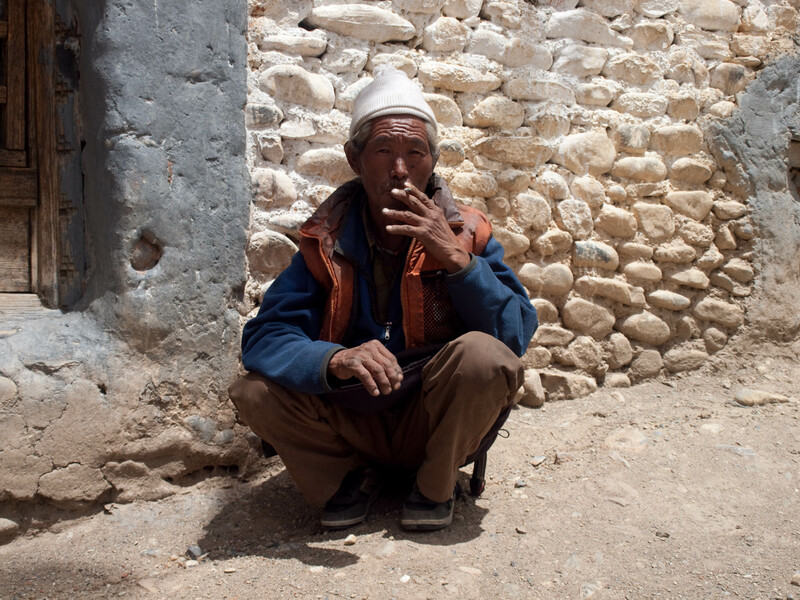 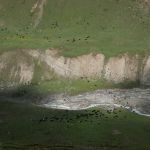 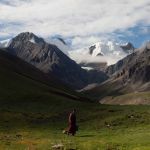 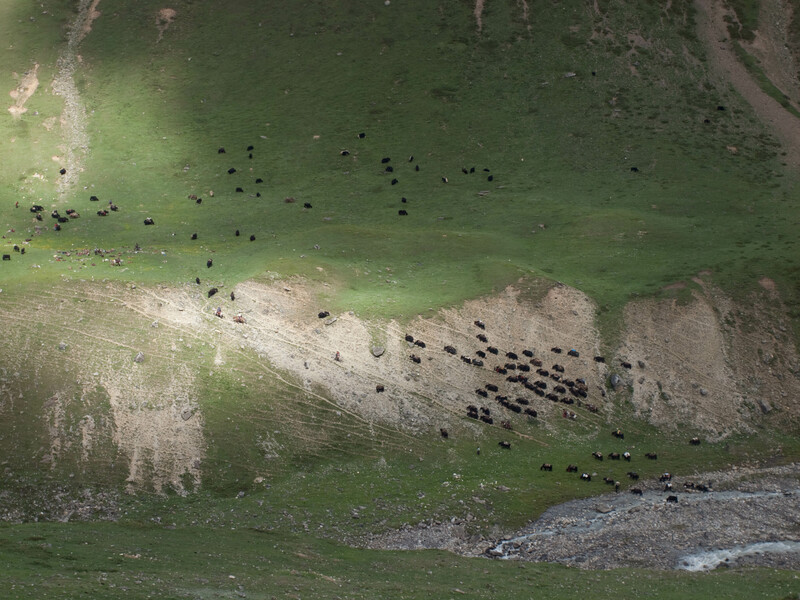 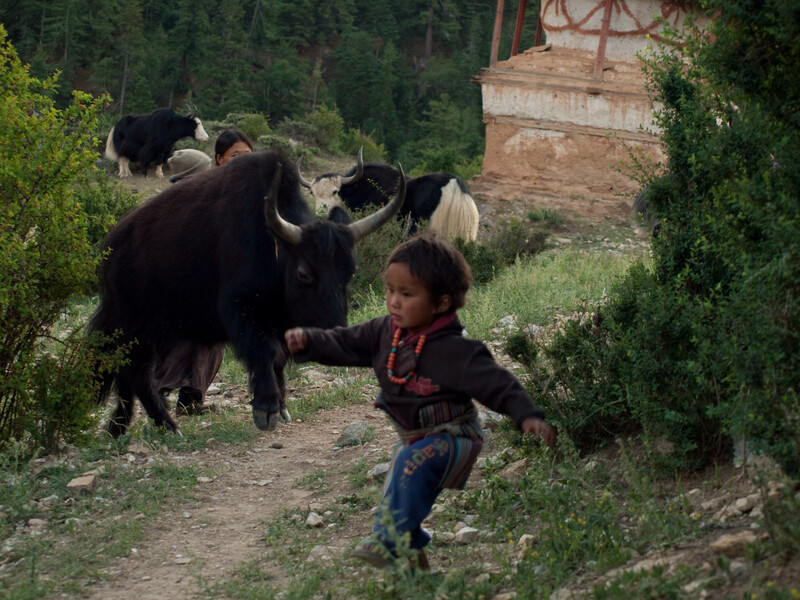 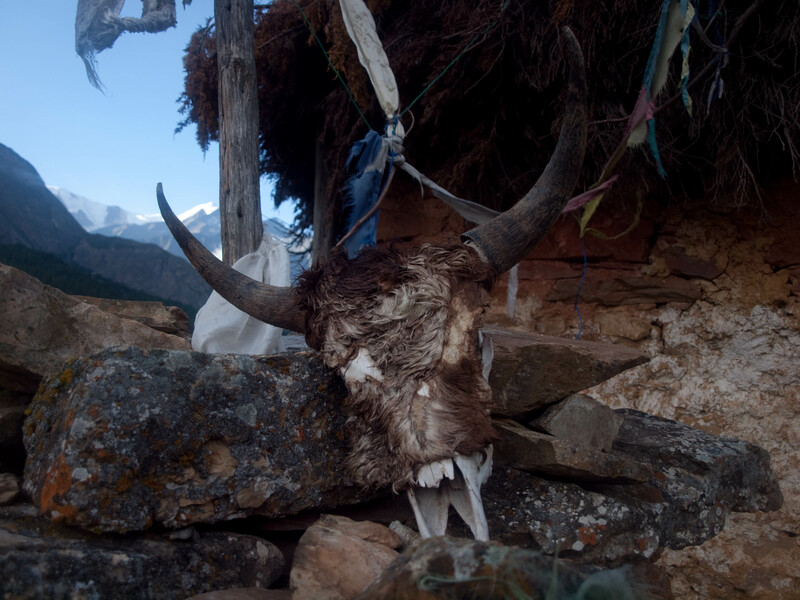 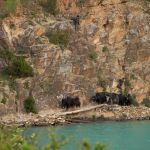 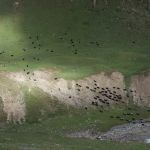 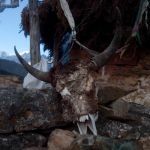 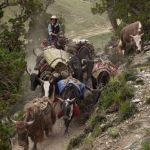 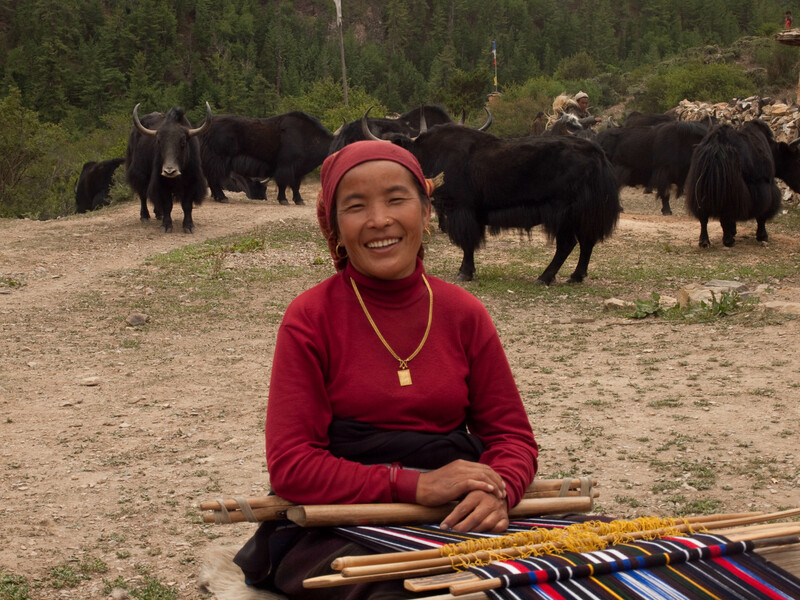 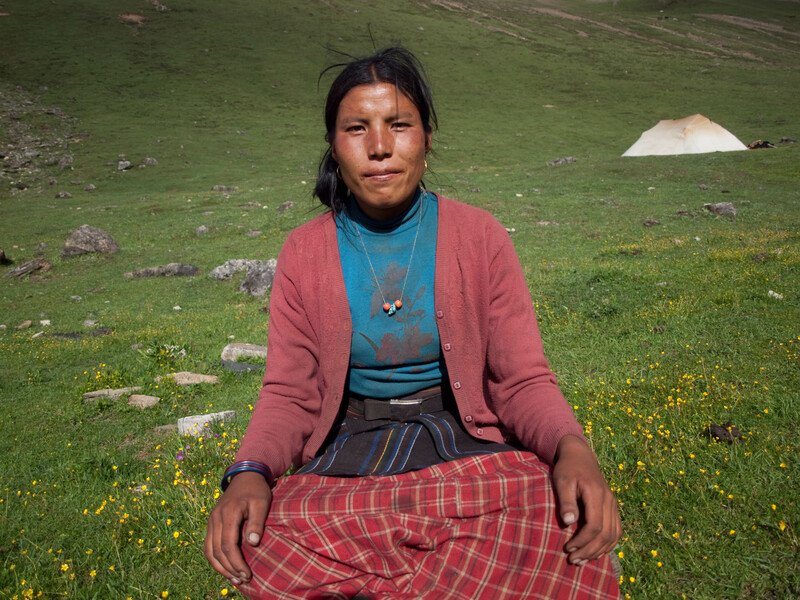 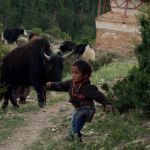 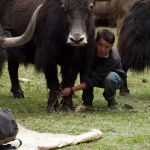 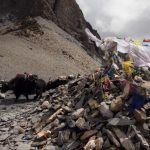 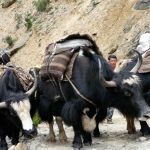 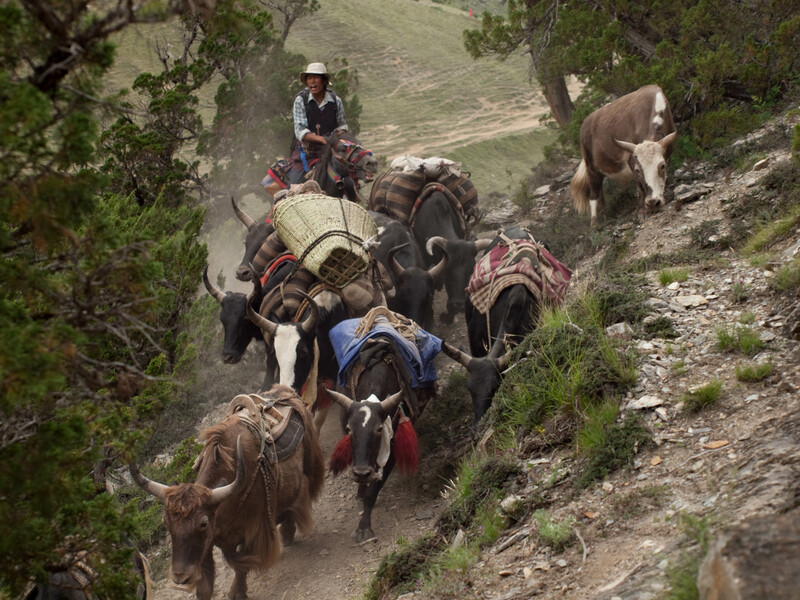 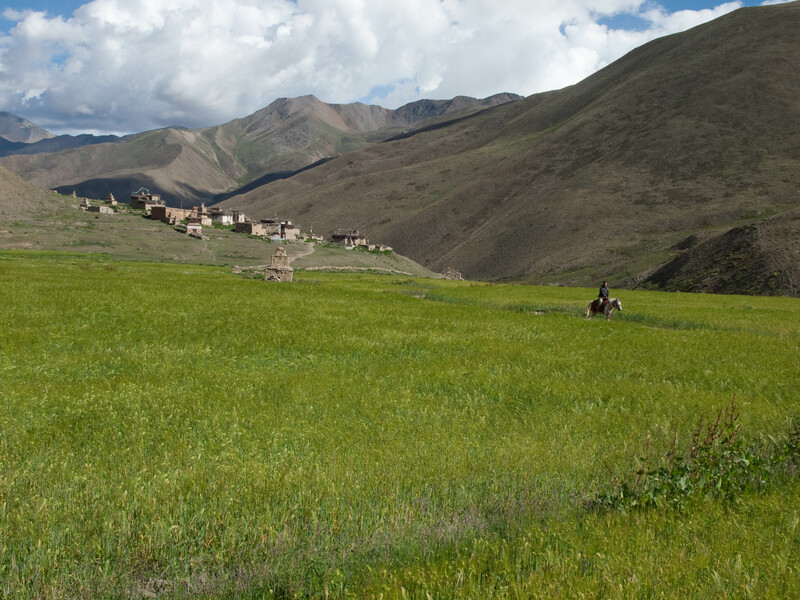 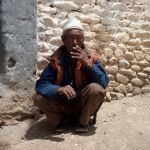 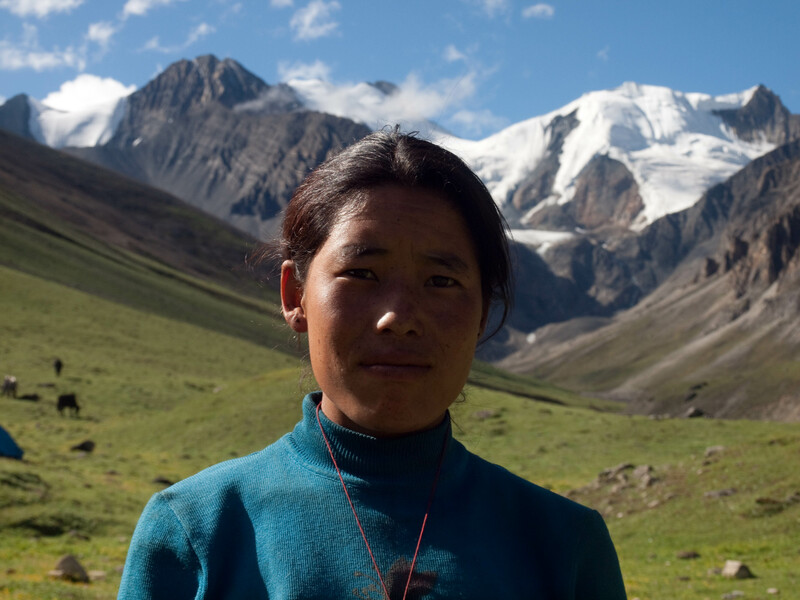 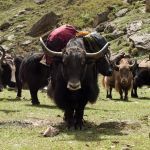 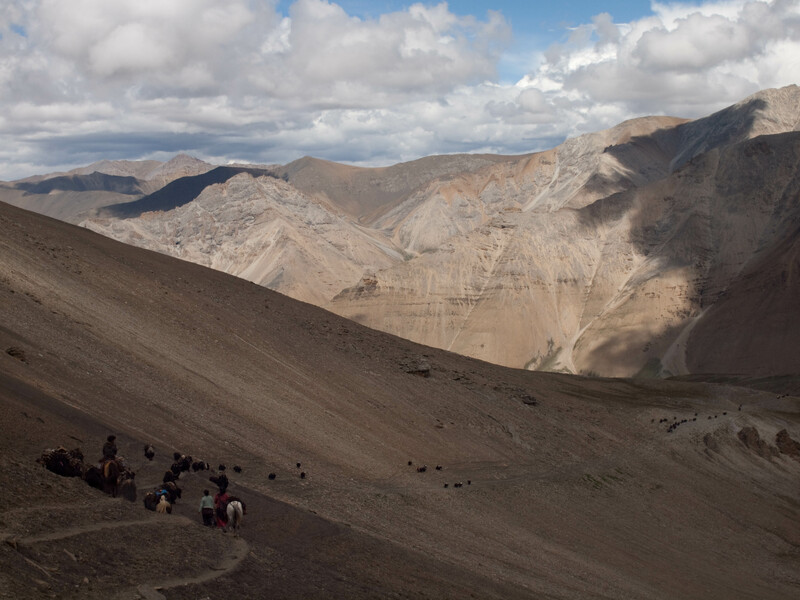 Throughout the year the yaks live on pastures further up north and once the herdsmen decide to make the trip to Tibet they drive them down to the village of Ringmo. 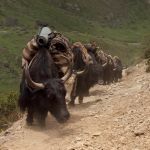 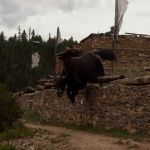 By luck we were in Ringmo just on the day that the yaks arrived in the village! 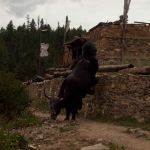 It became a very hectic day in the village. 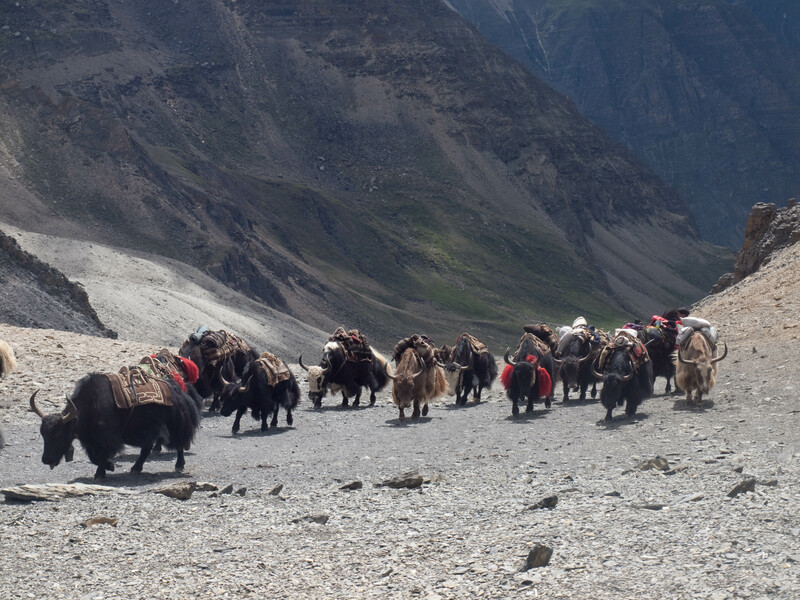 Many of the villagers – maybe 50 – were part of the caravan and the men started packing for the long trip to Tibet right away. 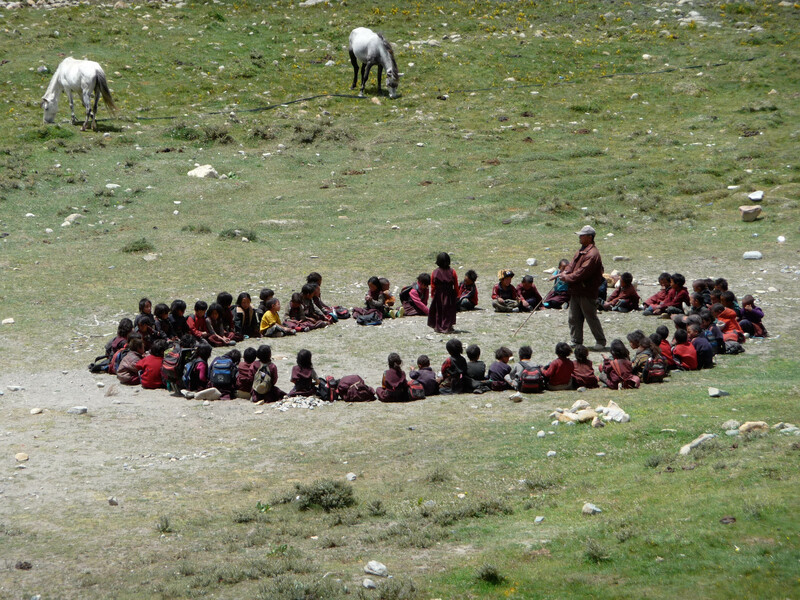 The women and children of the village where meanwhile busy with keeping the yaks out of the alleyways of Ringmo and instead hoped to gather the massive animals on the nearby grassland where they would wait for the next morning when the caravan would leave the village to travel to the northeast to reach Tibet. 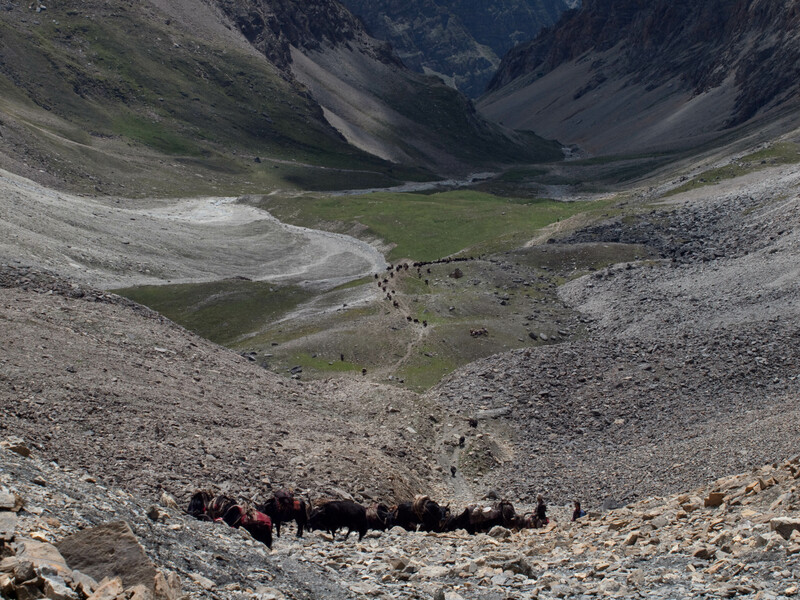 The caravan and the two of us had the same direction of travel and on the next day all of us left Ringmo together. 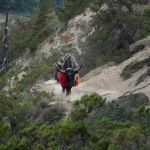 It was an extraordinary experience to walk with maybe 200 of these enormous animals – I have put many pictures in the gallery below that hopefully give an impression of these days. 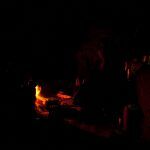 The first night we camped a little away from the caravan to not disturb them. 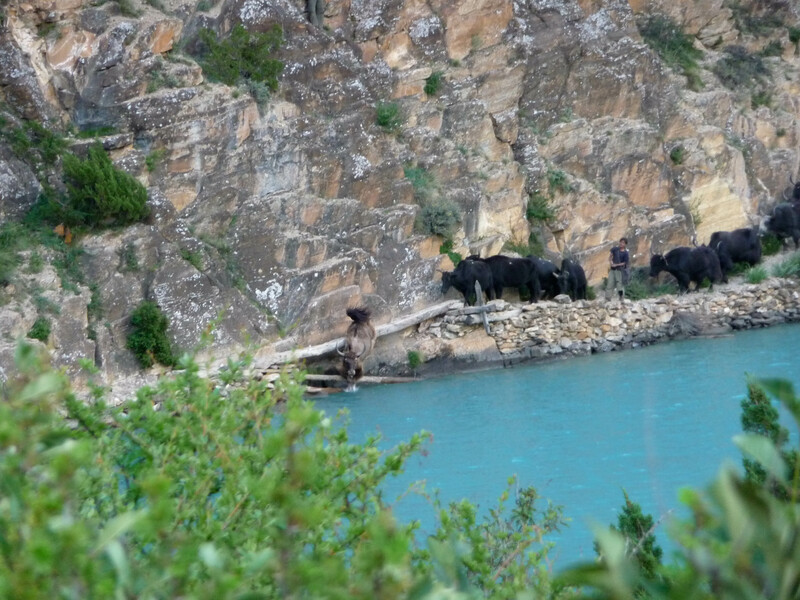 I think for everyone involved – villagers and animals – it was the most exciting time of the year. 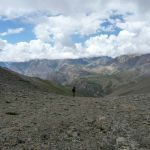 On the second day with the caravan we had to pass a 5,000m pass (the Baga La). 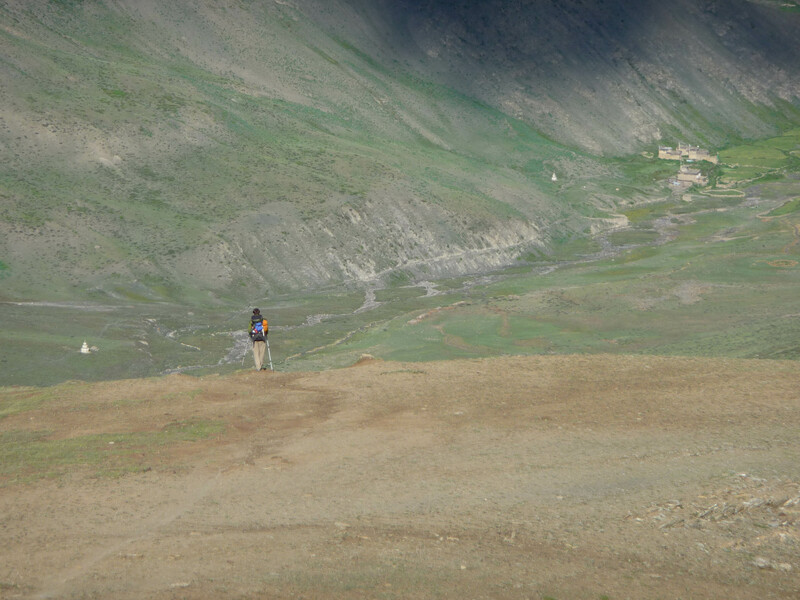 On the way up a group of the people from Ringmo offered Andi and me to join them. 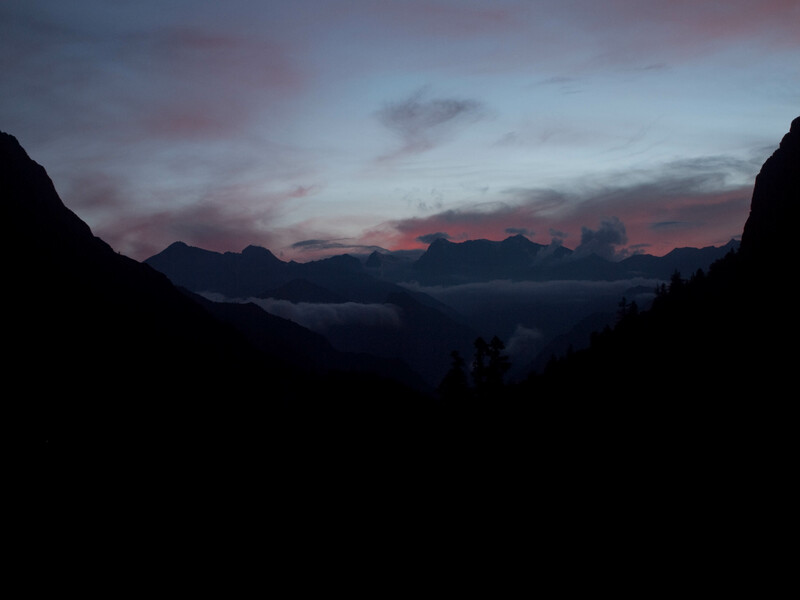 Of course we agreed. 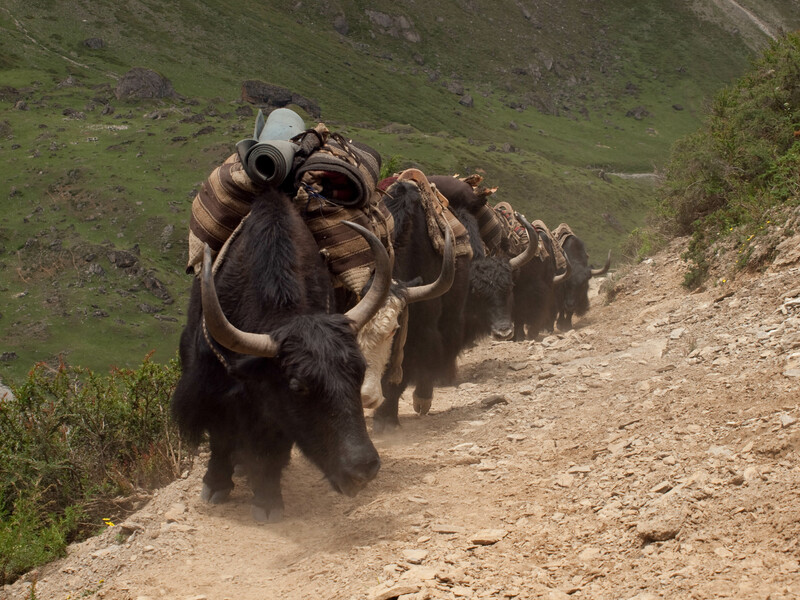 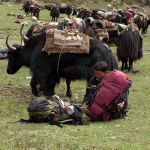 It was very nice to spend time with the people from Ringmo, but it was also very helpful because one of the yaks was taking our heavy backpacks. 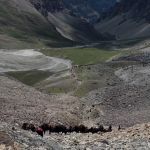 We were part of the caravan! 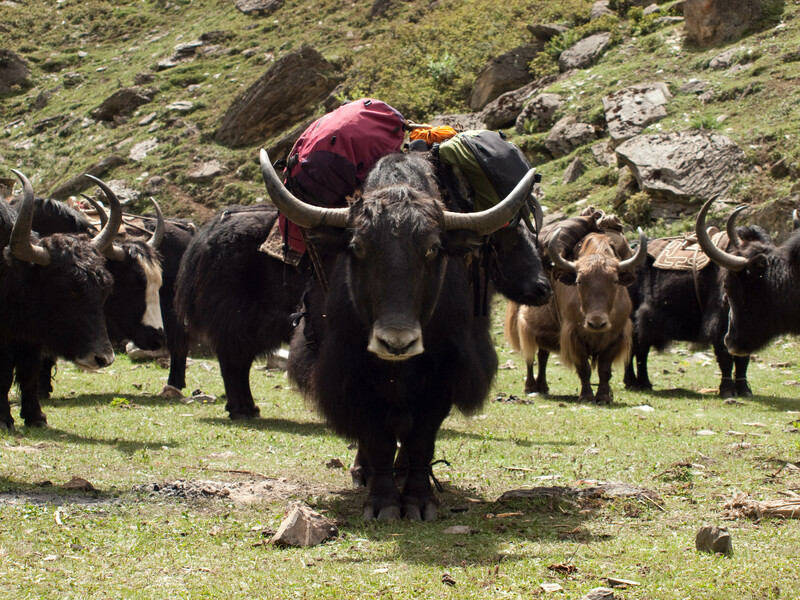 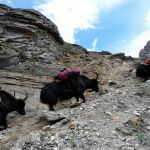 For most of the day we climbed up the Himalayan mountains alongside the enormous yaks. 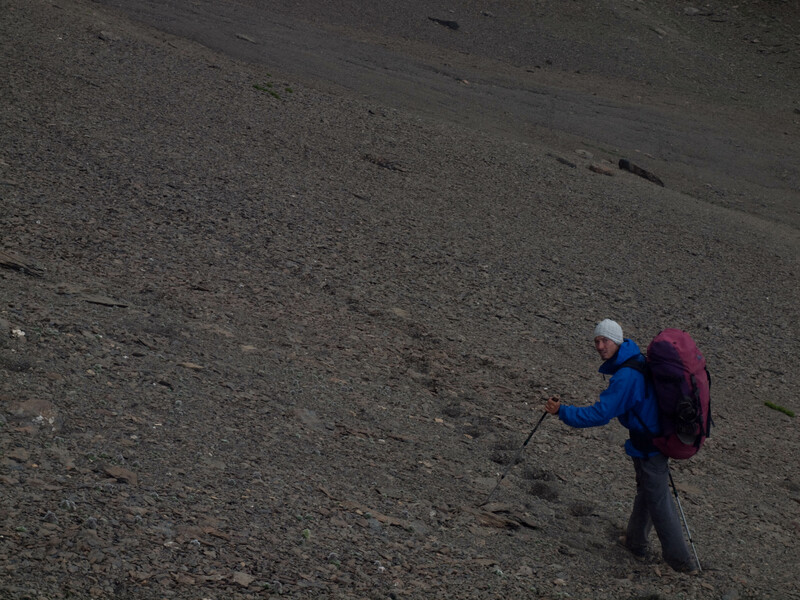 In the gallery you see how steep the trail was. 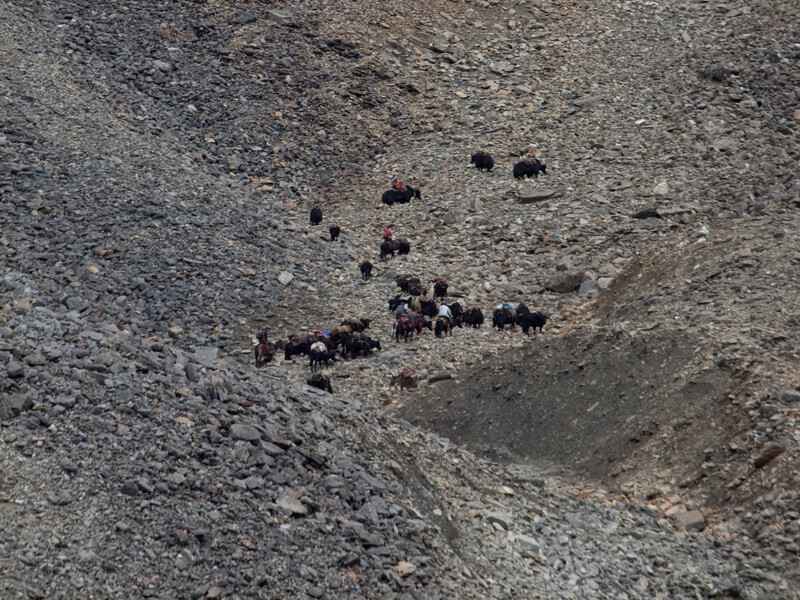 The skills of the animals to climb these slopes was impressive, the steep descent on the other side even more so. 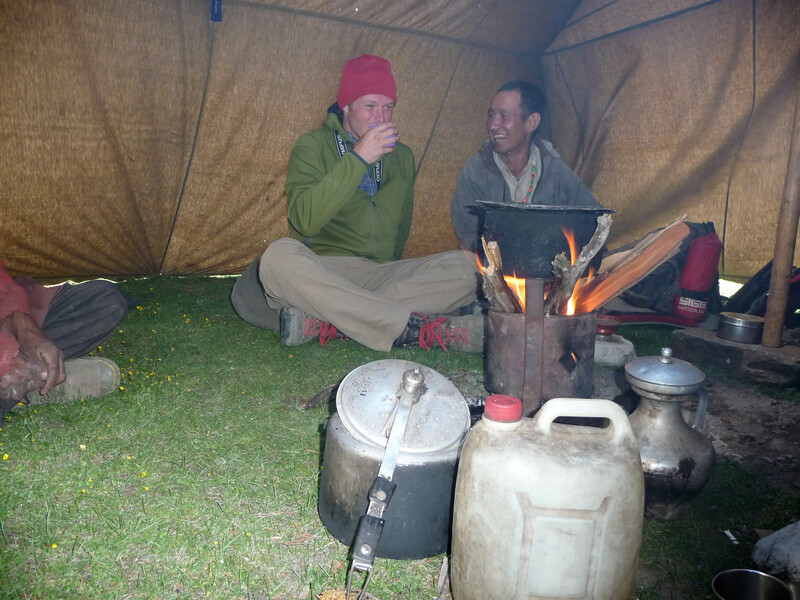 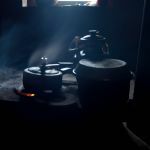 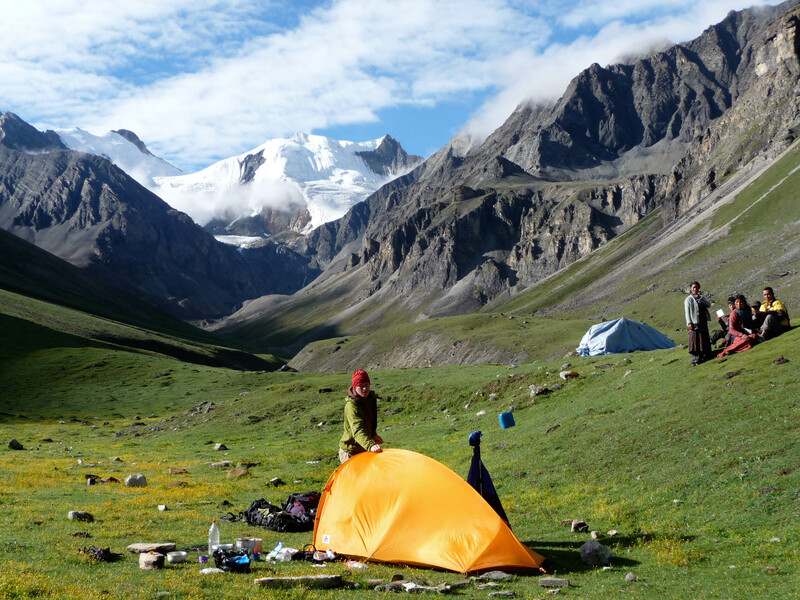 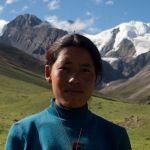 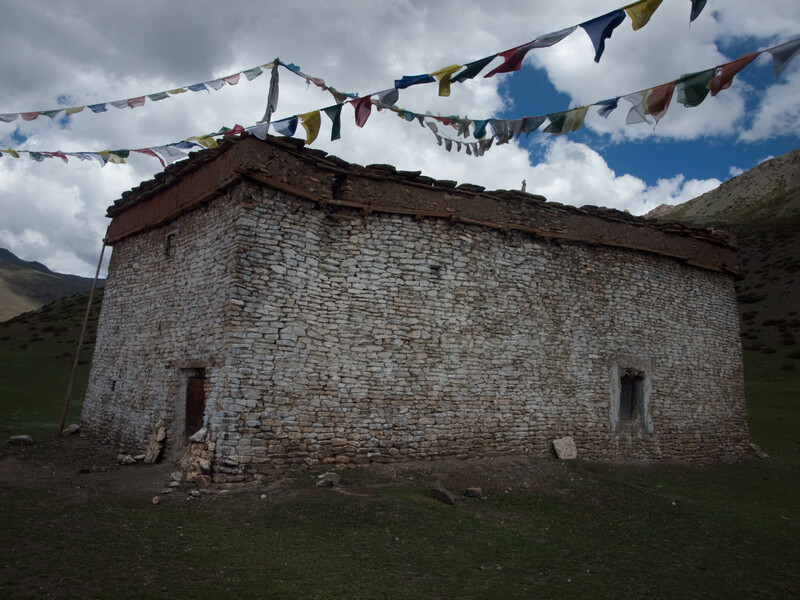 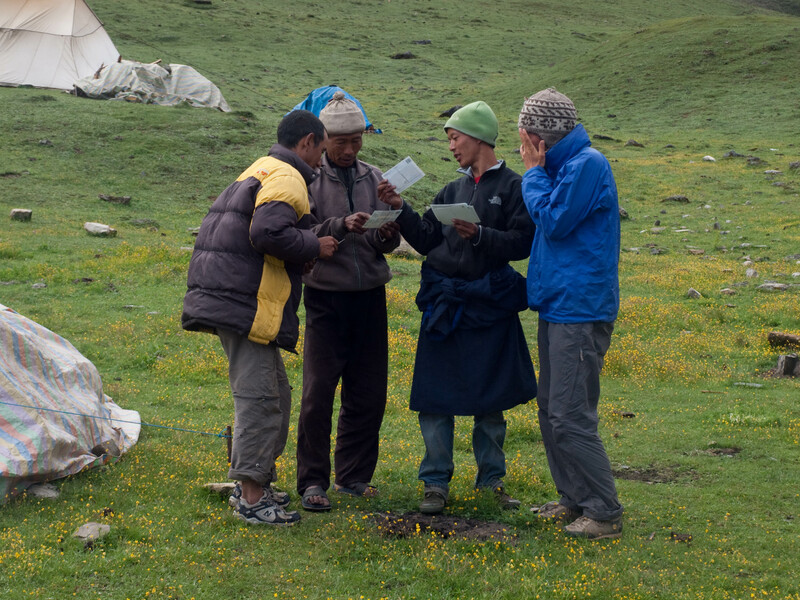 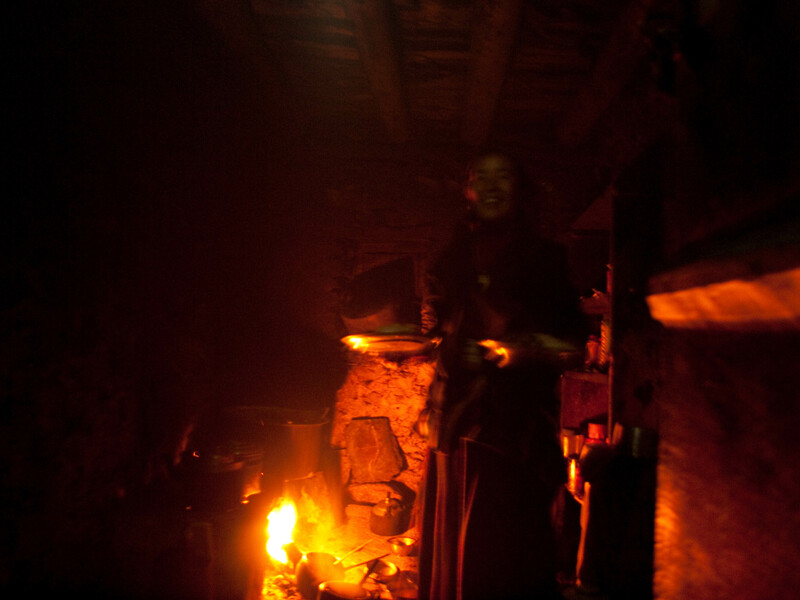 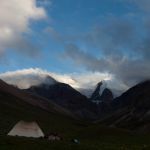 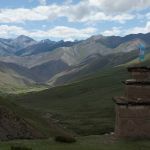 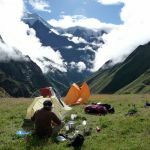 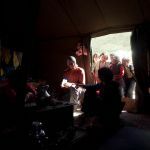 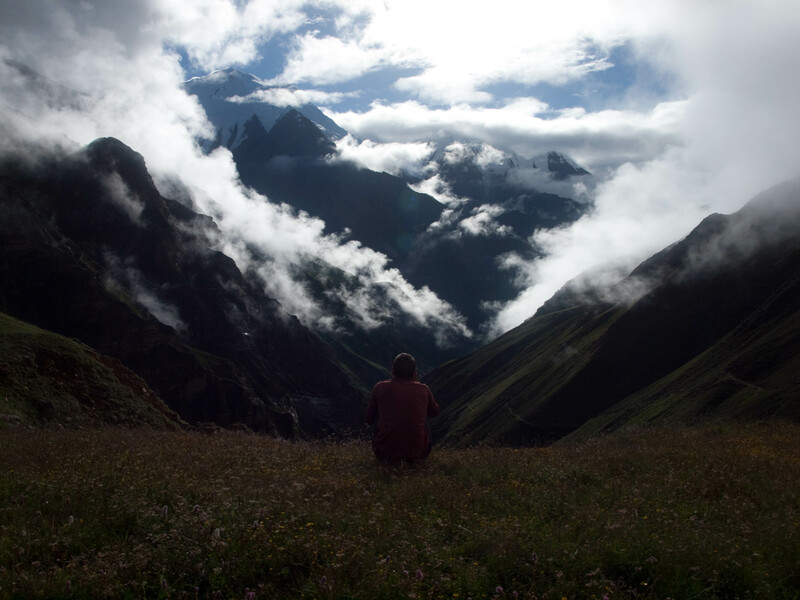 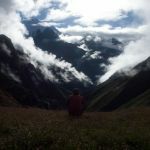 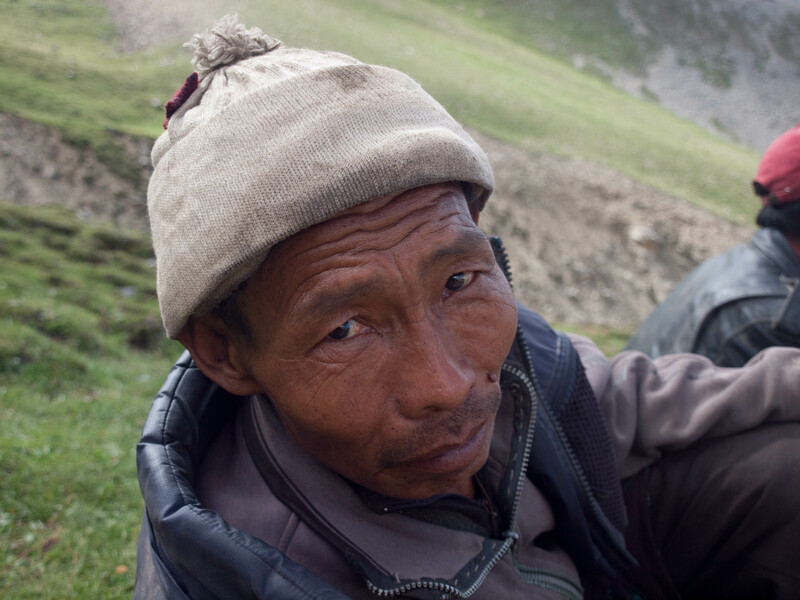 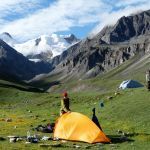 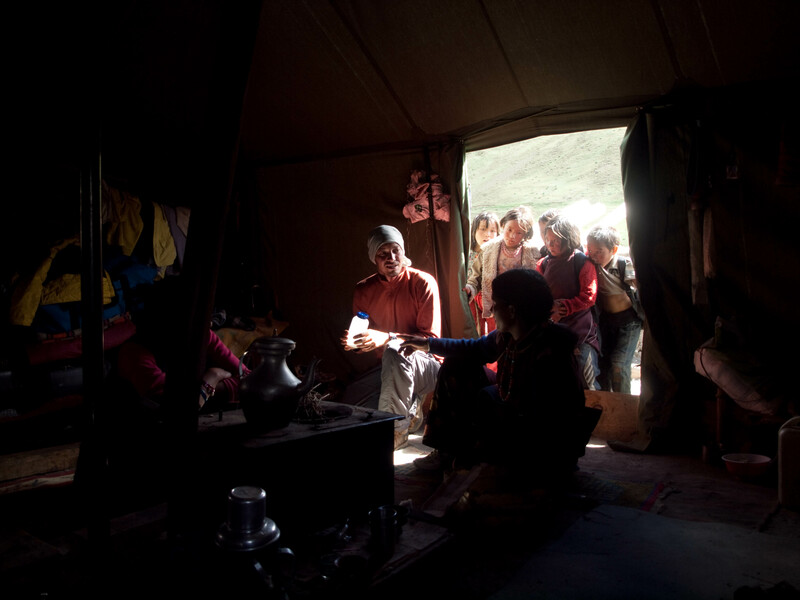 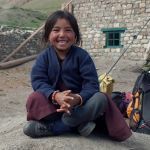 In the afternoon we erected camp on a high mountain meadow and spent the afternoon drinking butter tea, eating tsampa, and talking with the people from the caravan. 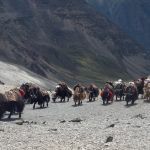 The animals needed a day of rest after the exhausting pass the day before and so Andi and I continued eastward and crossed another 5,000m pass to reach the Tarap valley. 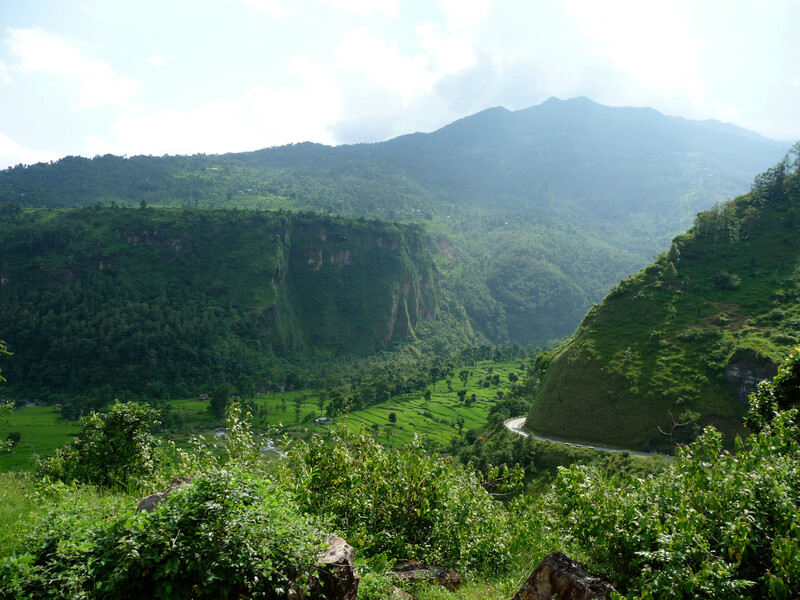 The valley is much greener than the area we had crossed in the days before. 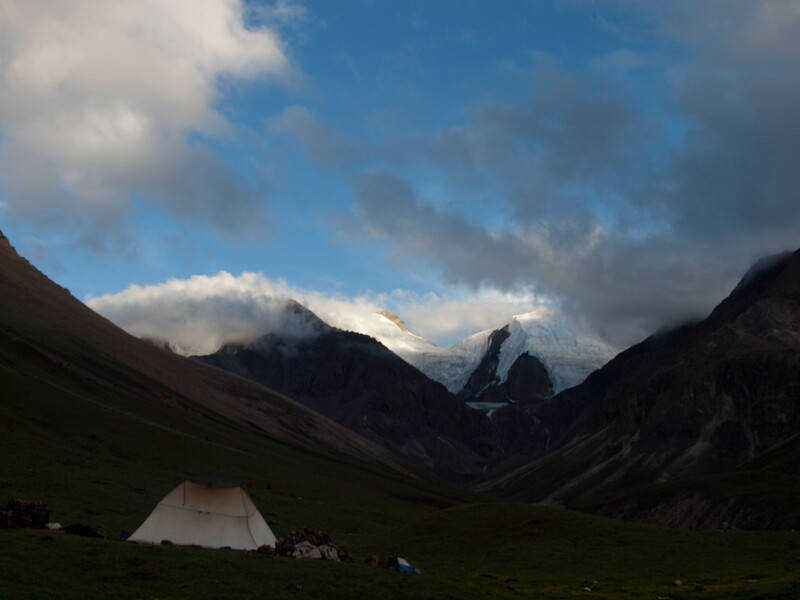 It was a good time to relax and we stayed for some nights at these lower altitudes. 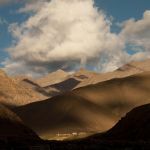 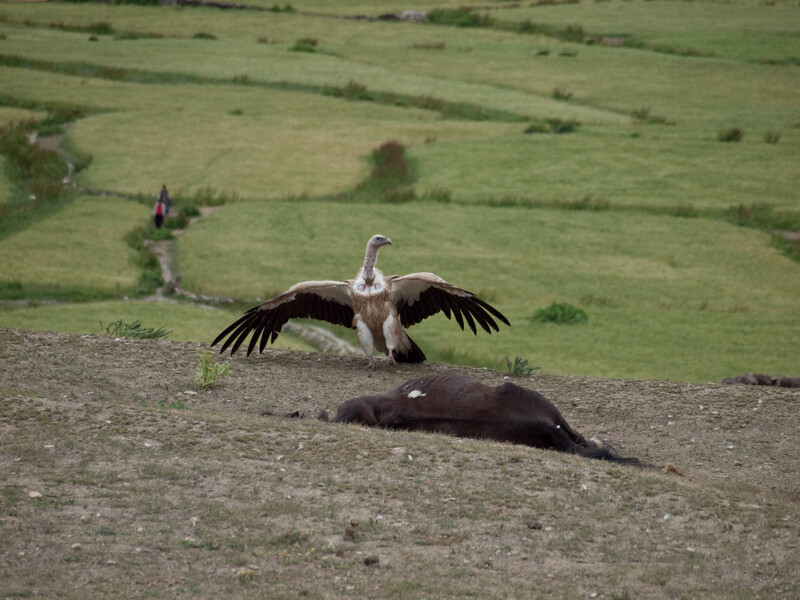 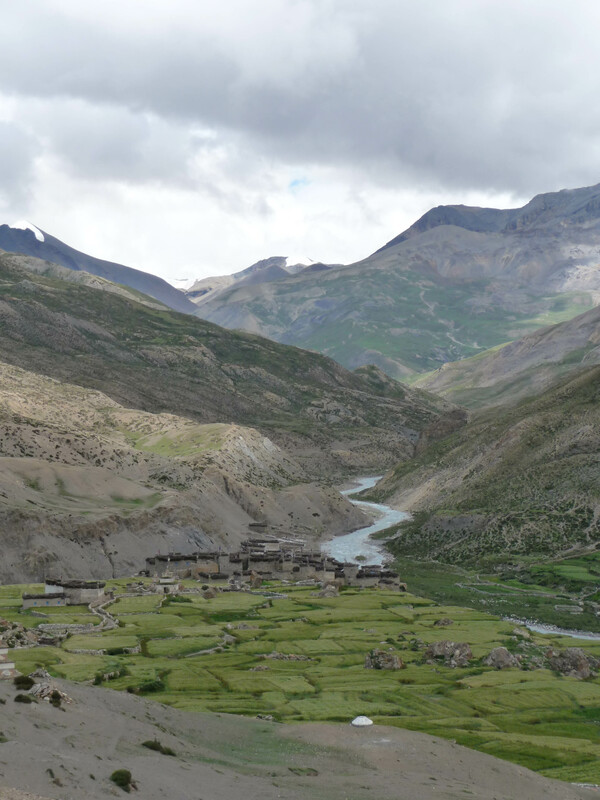 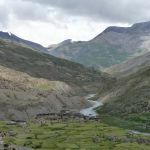 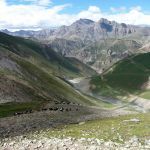 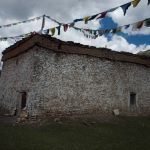 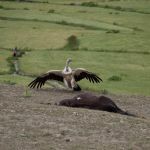 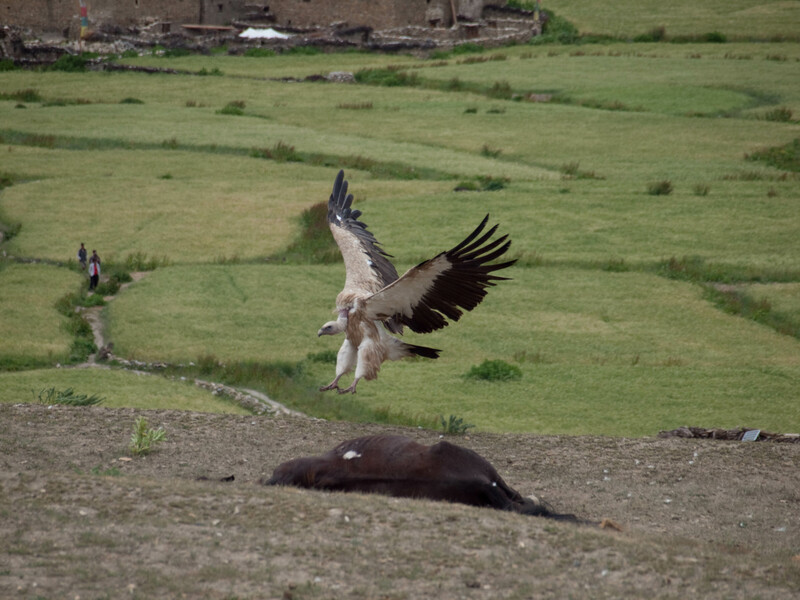 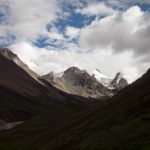 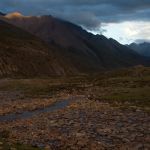 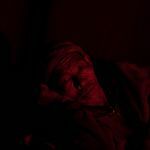 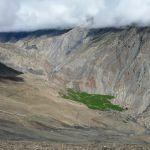 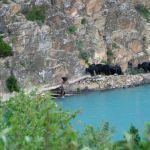 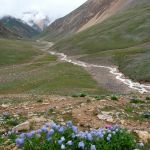 The pictures from the Tarap valley and its main settlement Dho show green fields, the monastery where we spent one morning, and the vultures that are eating a mule. 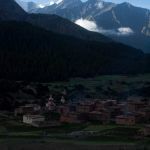 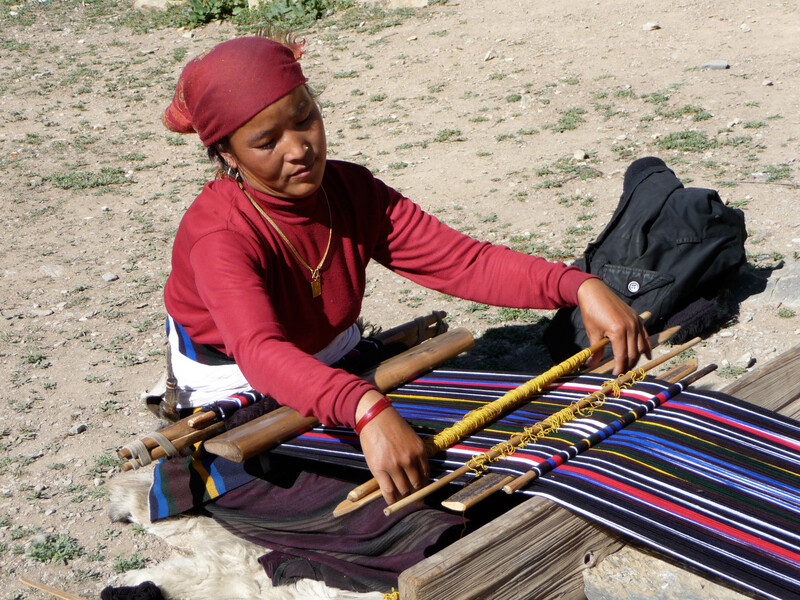 The valley is close to Tibet and products from China are sold here. 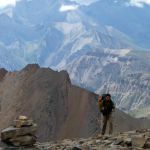 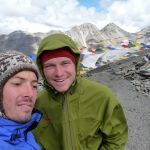 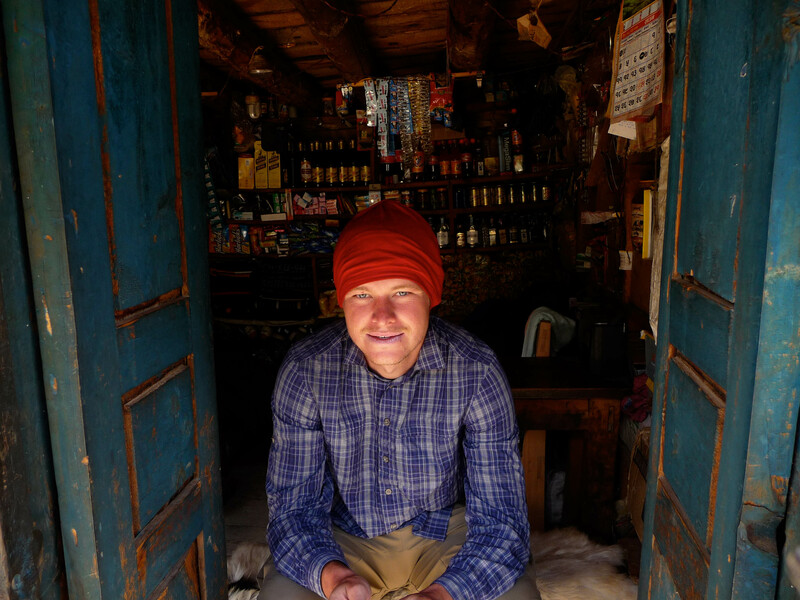 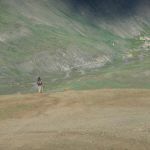 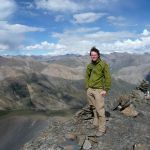 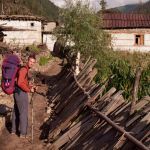 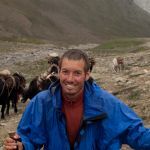 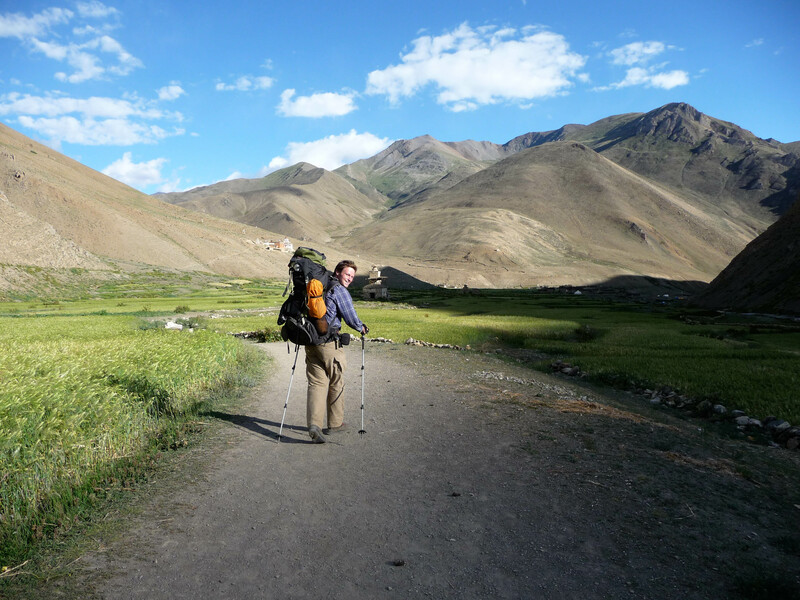 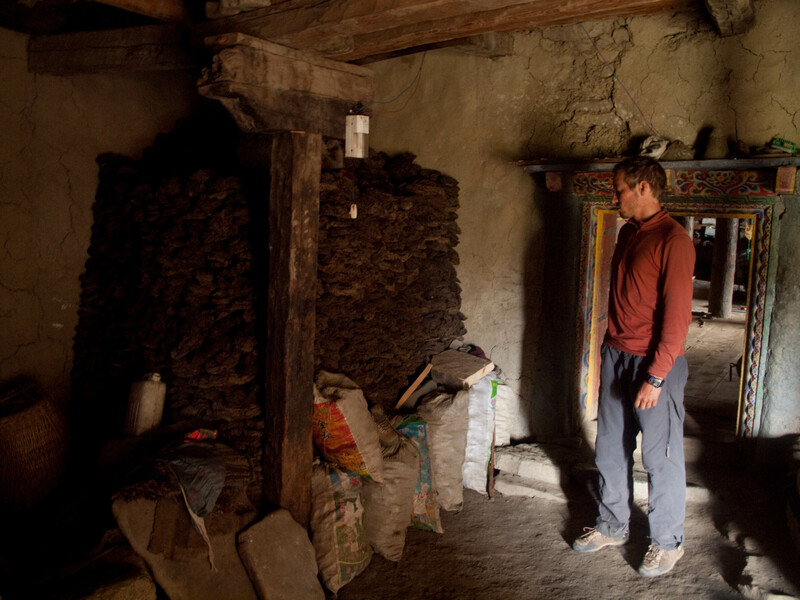 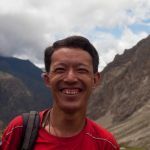 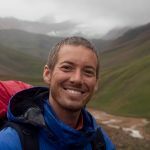 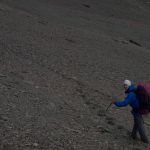 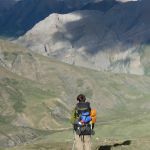 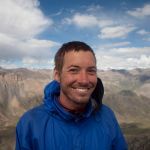 We stocked up on noodles, tea, and other food that we needed for the long and remote last section of our Dolpo traverse. 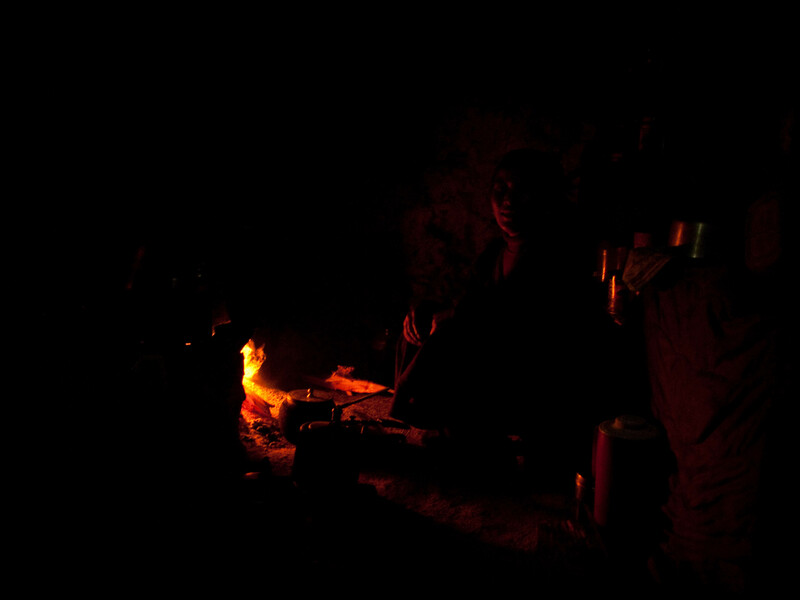 From Dho Tarap we left with food supplies for more than one week. 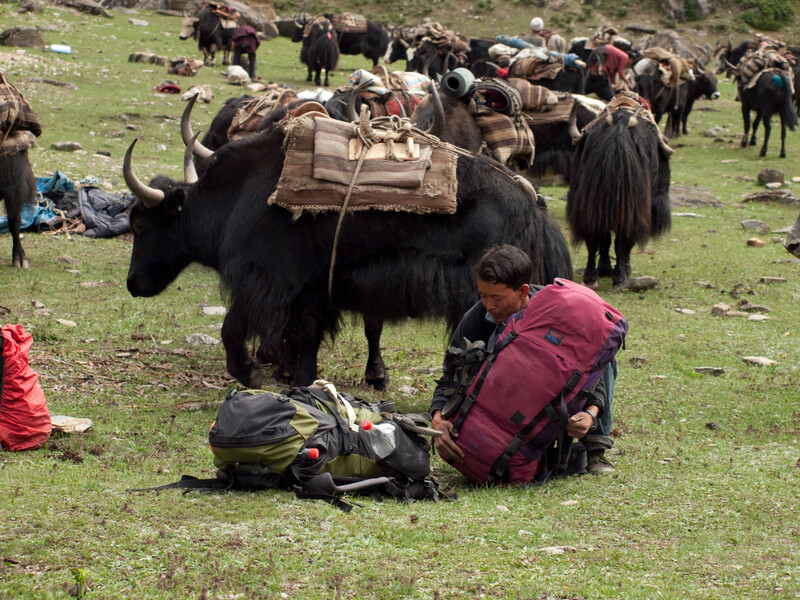 The backpacks were heavy and these were long days of walking and we only saw a handful of people. 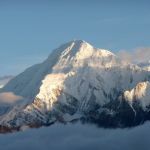 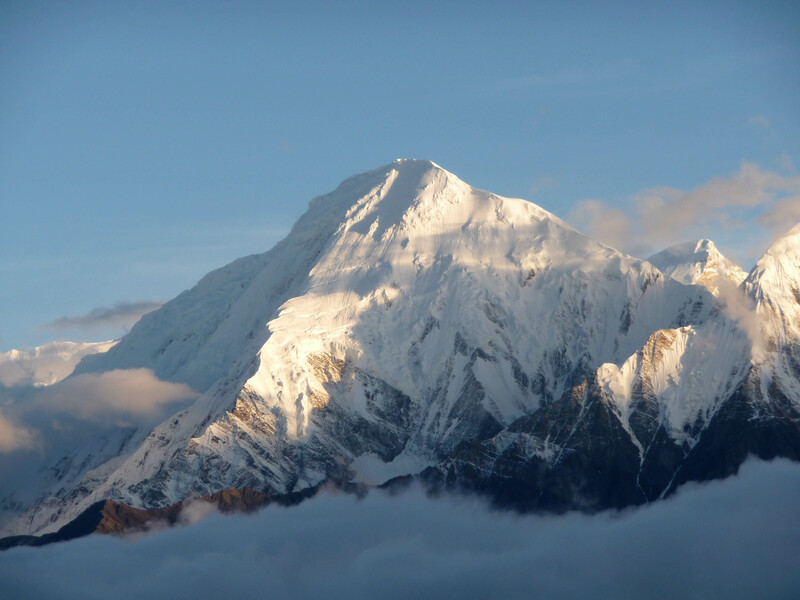 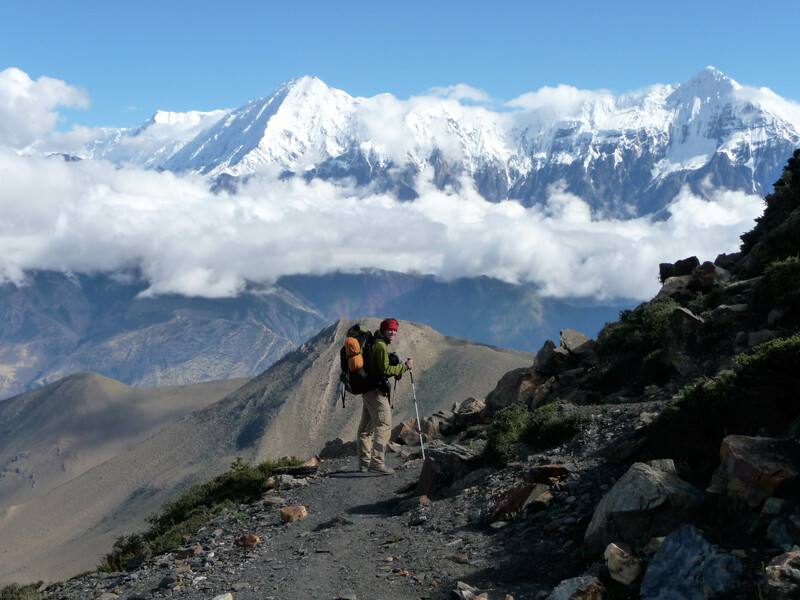 But the scenery was stunning and the weather in the rainshadow of the 8,167m high Dhaulagiri was good. 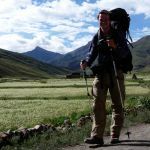 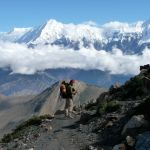 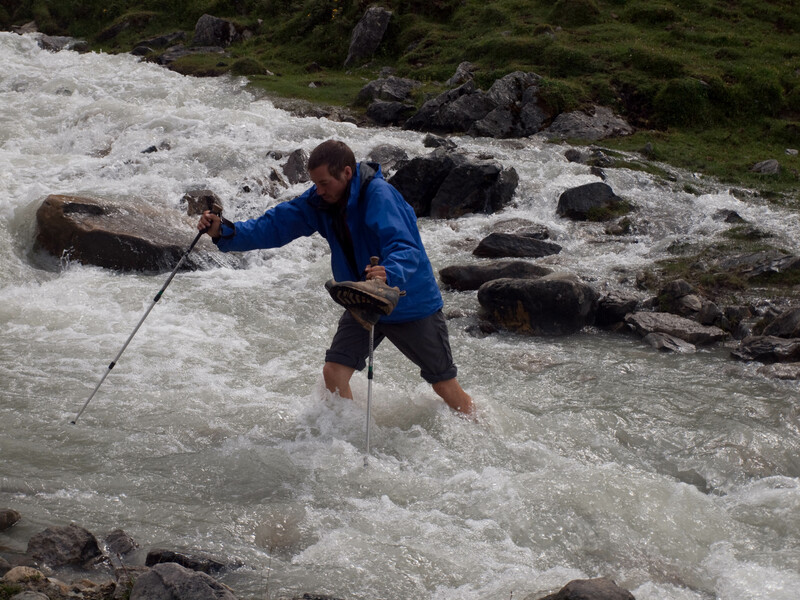 Our traverse was completed when we reached the Annapurna range and descended into the Kali Gandaki. 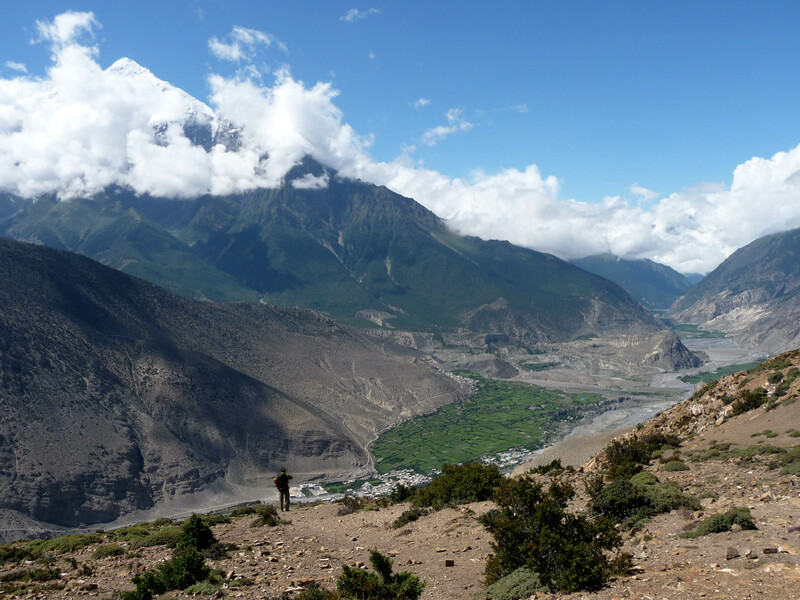 This was the valley where I had been 3 year earlier when I walked around the Annapurna massif. 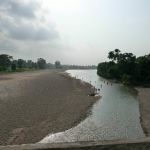 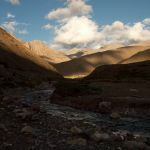 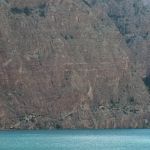 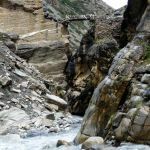 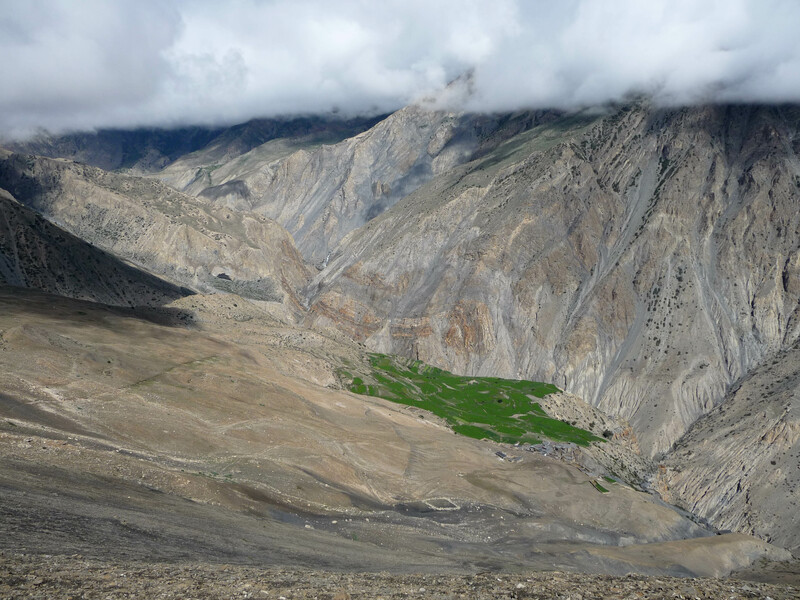 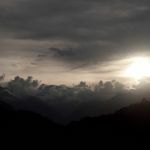 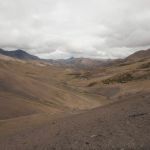 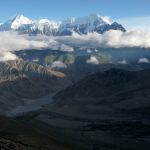 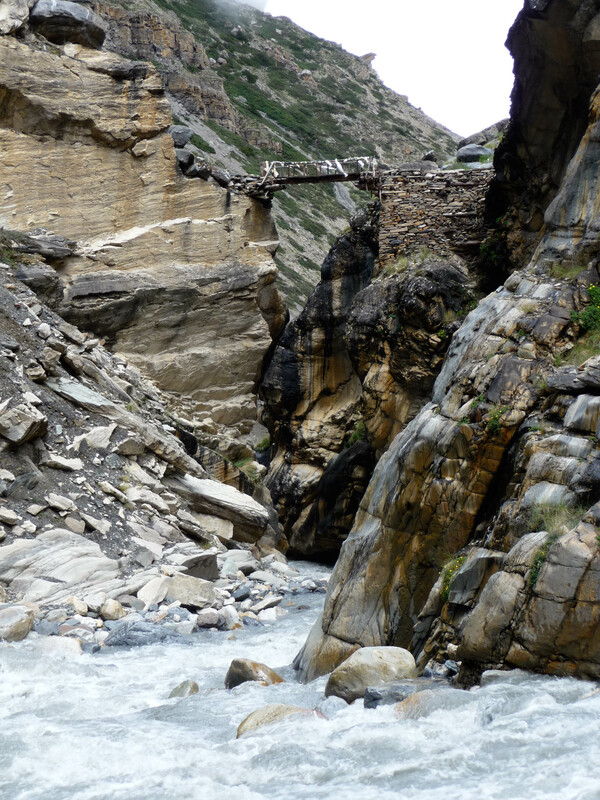 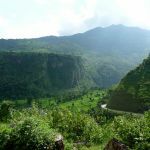 The valley had changed significantly since there was then a street that connected Jomson with the city of Phokara south of the Himalaya range. 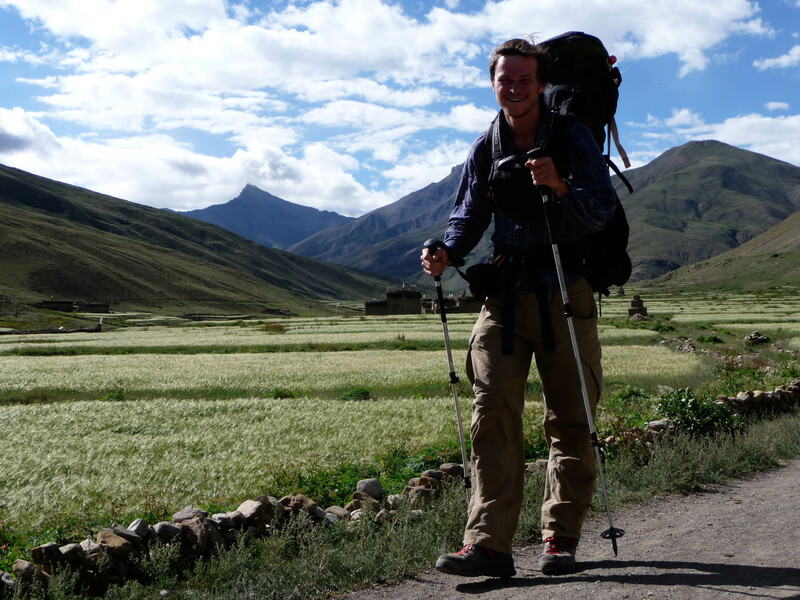 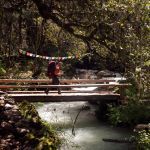 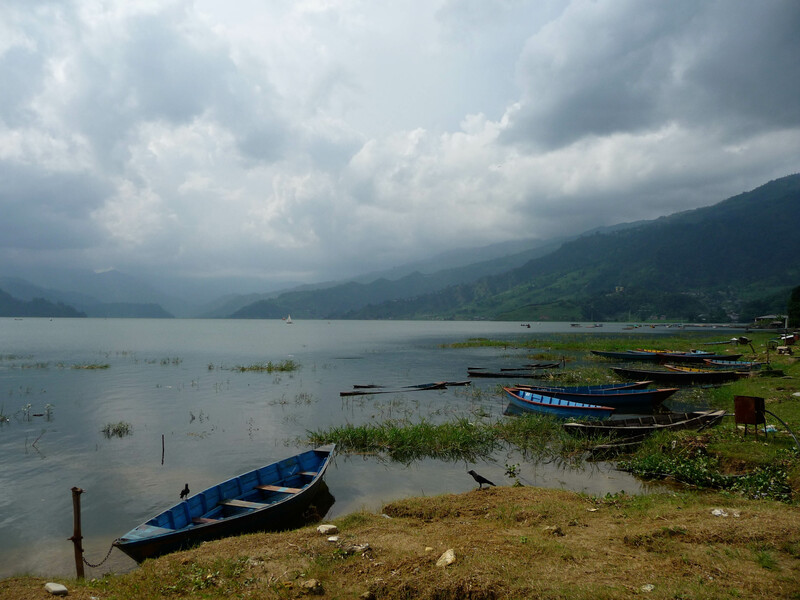 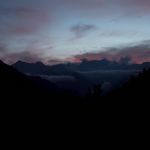 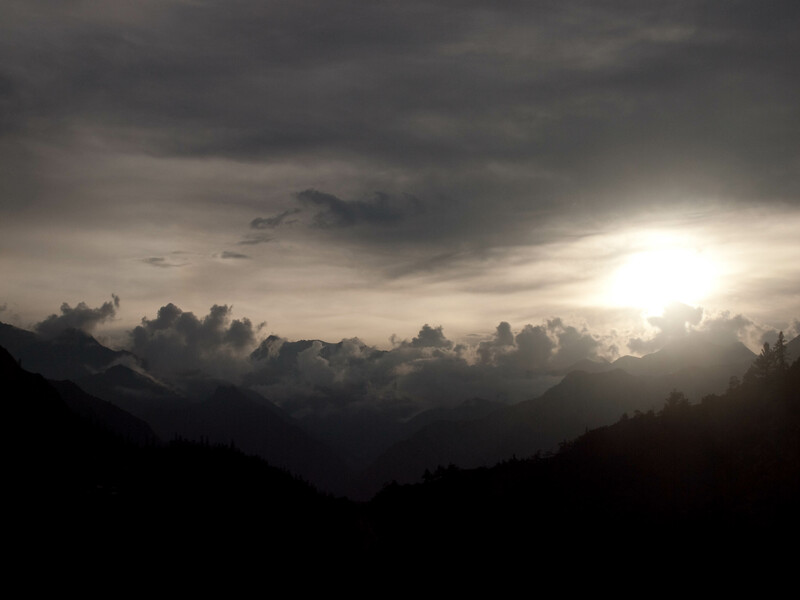 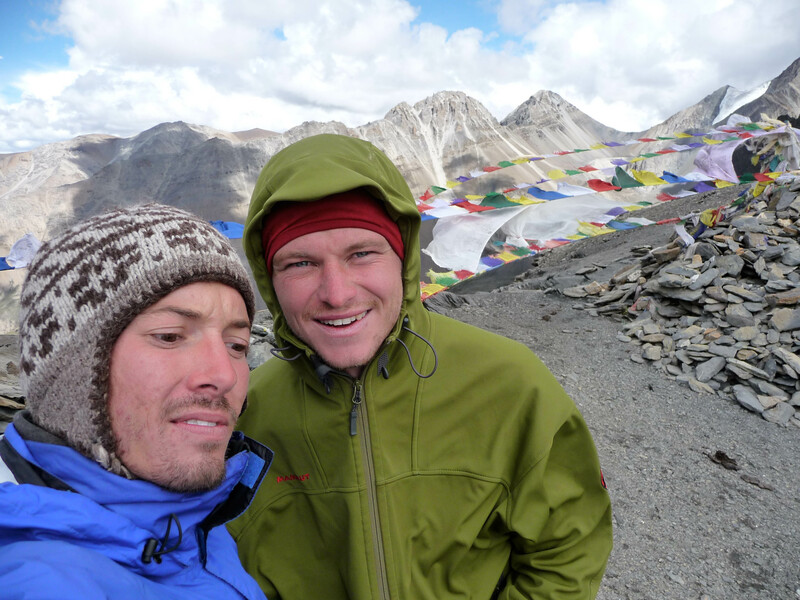 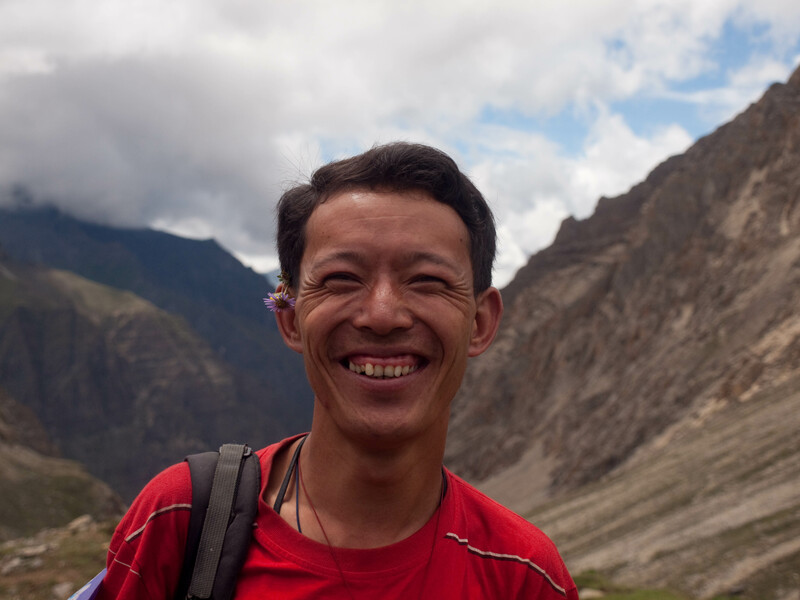 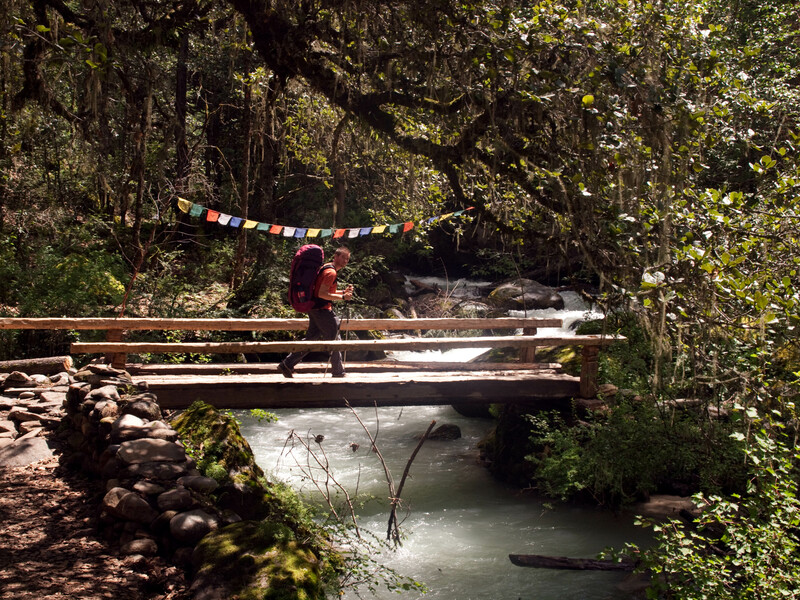 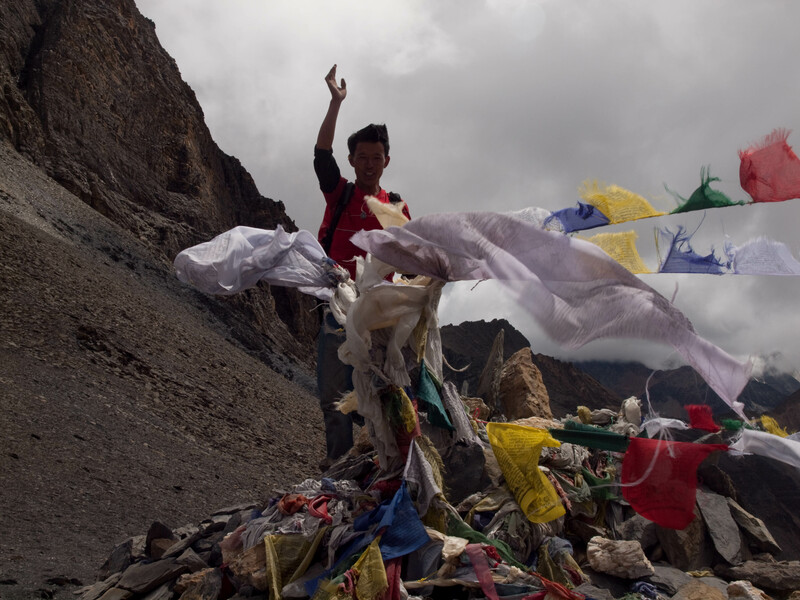 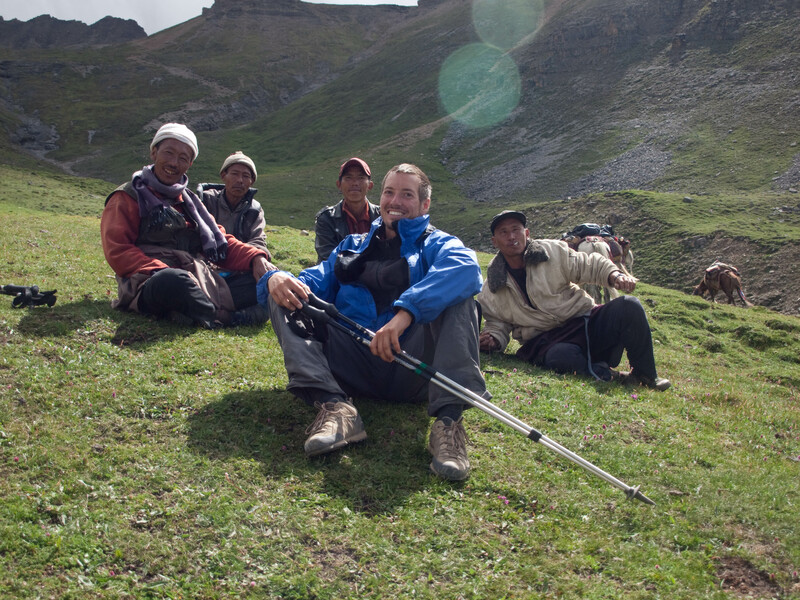 It took us almost three weeks to cross the beautiful northwestern corner of Nepal. 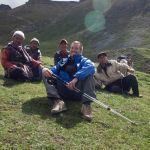 The time that we had left we visited friends I had met on my previous trip to Nepal and we travelled back to New Delhi by train to return to Austria from there. 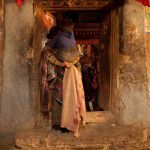 The pictures in the gallery are taken by both of us.